I was born on the northwest coast of England. 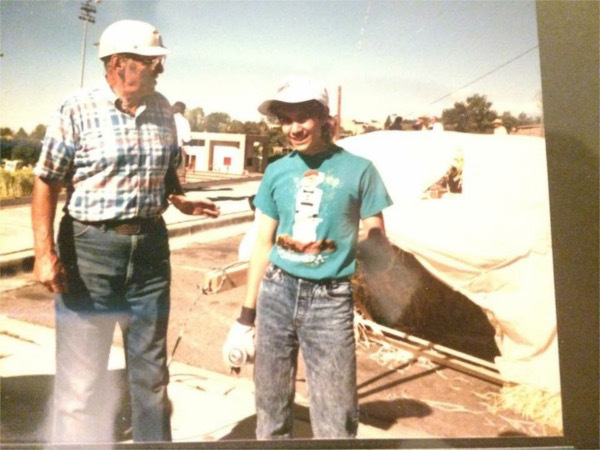 I first arrived in Santa Fe in 1984. I had traveled extensively for many years as a fashion model, and lived in many amazing places; New York, Paris, London, L.A. I was so taken by the diverse culture, history, landscape, weather and lifestyle of Santa Fe that I decided to make it my home. I finally moved here permanently in 1990. I feel Santa Fe is my true home and I'm so glad that I have been able to live in this enchanted place for so many years. 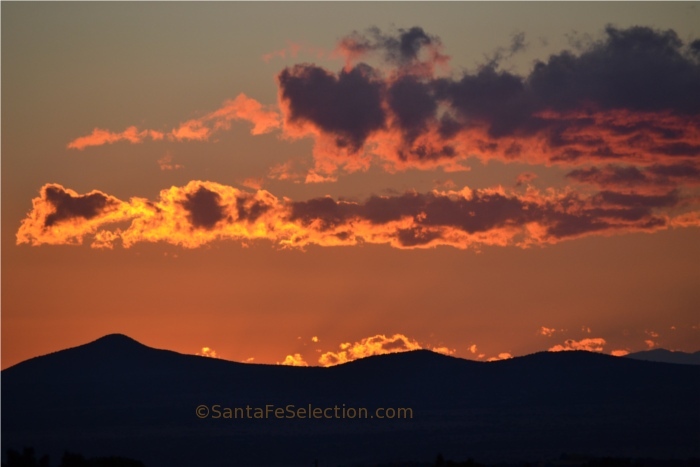 In 2010, I began Santa Fe Selection, the free mobile and online guide to the authentic Santa Fe experience. It is aimed at helping guide travelers to the businesses and experiences that I believe make Santa Fe unique. I hope you're able to visit here someday. There really is no place like it. And if you like my blog, please comment. I am available to help you with your questions about your trip here. 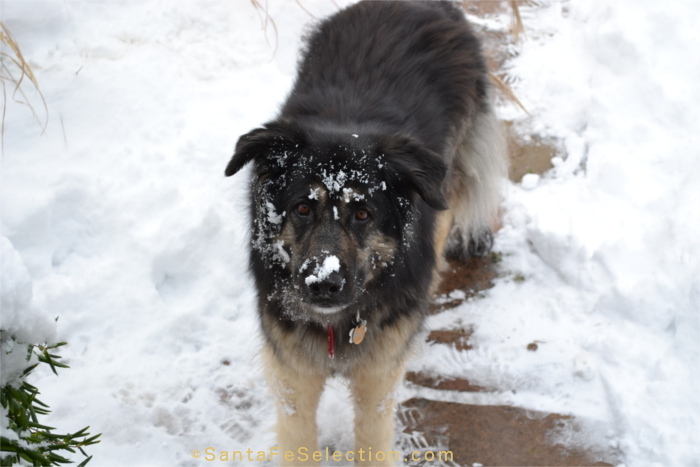 Feel free to comment on my blog or contact me directly at info@santafeselection.com or (505) 470-2991. I look forward to hearing from you. Best Wishes, Maria Johnson. 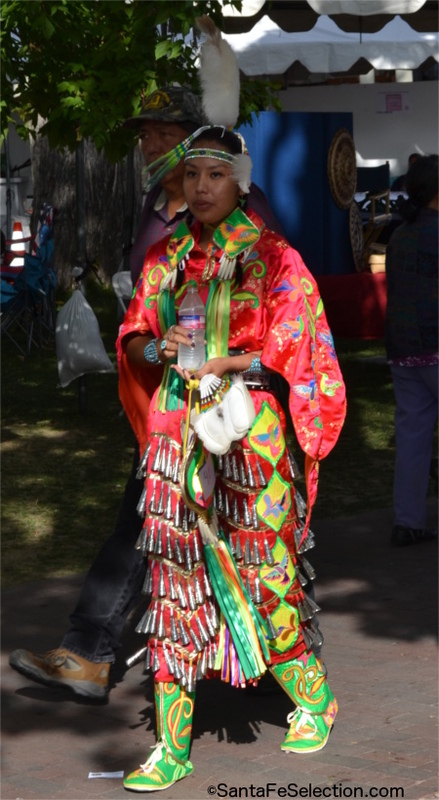 One of my favorite highlights of the SWAIA Annual Indian Market is the Native Peoples’ Traditional Clothing Competition. The intricate work involved in these pieces represents the history, traditions and cultures of a variety of Native tribes. 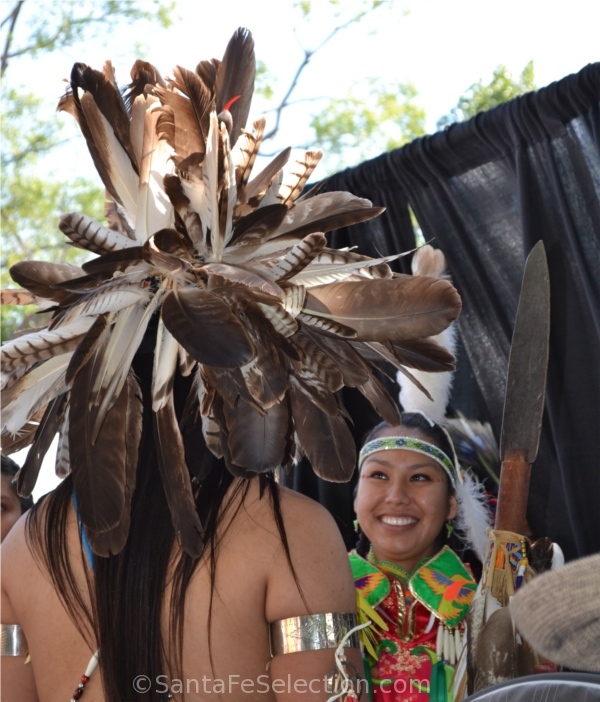 SWAIA’s Indian Market brings Native Peoples together from around the United States and Canada. 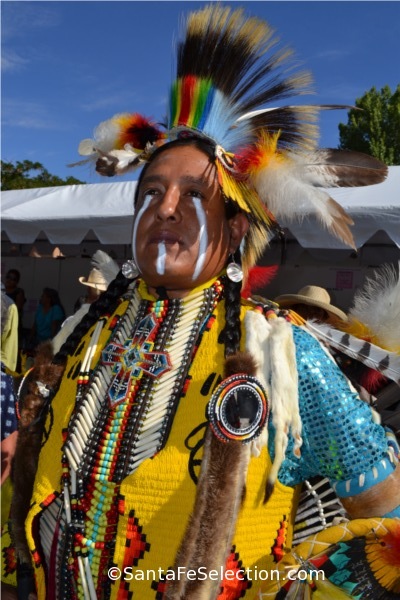 As so many tribes converge, it’s a wonderful opportunity to see the styles, and traditional, ceremonial regalia as they compete for the best in their category. It is not always easy to get up close to photograph, and ceremonial events at the individual pueblos don’t usually permit photography, so I’m glad I was able to capture a few images of the beautiful clothing that is an integral part of the time-honored traditions of the Native Peoples. I’ve compiled some images and labeled them where I could. I wasn’t always able to ask the names of the tribes or what the dress styles meant, and I’ll risk being thought of as quite ignorant, but if anyone has answers or corrections, please send me a note to enlighten me further, and I’ll enter the title in the appropriate image. Thank you! I hope you enjoy this little gallery I’ve put together. Warrior, whom I think may be of an Apache tribe, with Dancer wearing “Jingle Dress”. Below on the left is a Navajo woman’s dress, and on the right is one of a young girl from the Kiowa tribe – both were in the Northern and Southern Plains category . The elaborate head-to-toe beadwork in the headdress and adornments, bags and shoes, and hand-sewn details are extraordinary. 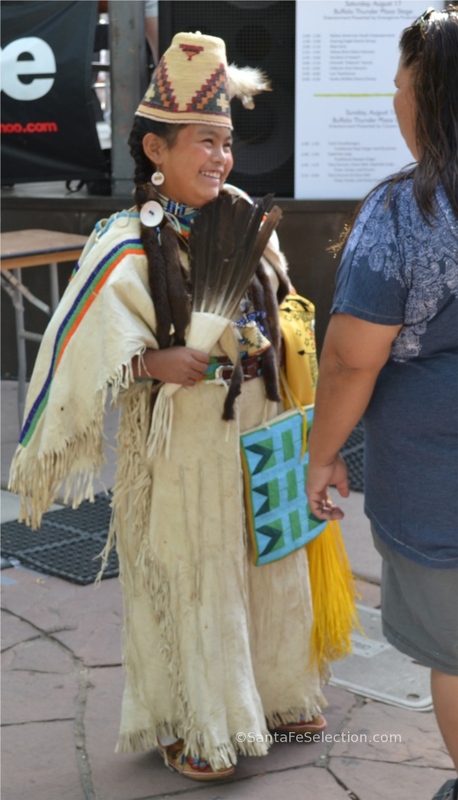 This adorable young girl below is affiliated with the Kiowa, Taos region. Her bag is completely beaded, and her dress features beaded detail. Her hat is hand-woven. From New Mexico’s Santo Domingo Pueblo, this piece is called “Sunrise”, worn at ceremonial dances to represent the rising sun. 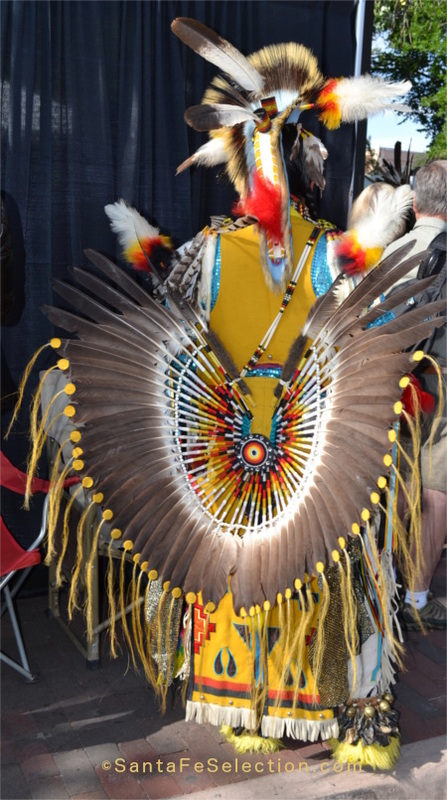 The beadwork and feather work are amazing, and the shells, beads and feathers make this very heavy to wear. Look at the feathers fanned in the back like sun’s rays!! 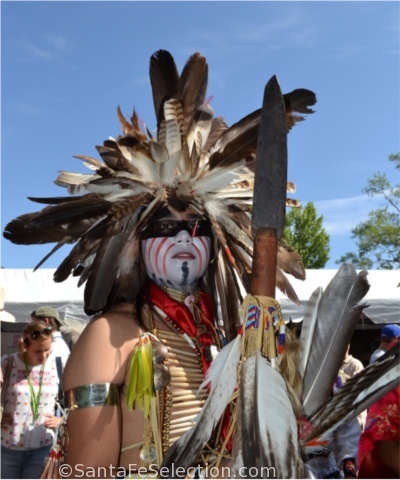 With fur trims, and eye-framing beadwork, ankle bells, and feathers, this is an Apache Warrior, though I’m uncertain as to which region he’s affiliated with. 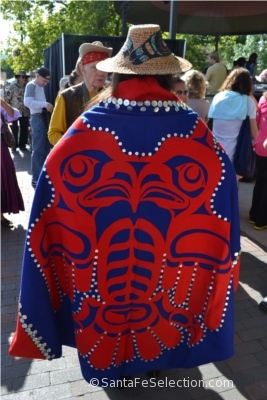 From the Pacific Northwest coast, this is a woman’s robe of the Haida People. She won first prize for the category of Northern and Southern Plains, women’s group age 18 and older. I really enjoyed the “jingle dresses.” They are beautiful to watch and hear as hundreds of silver cone-shaped bells sing along as the ladies walk by. I’m uncertain of the particular tribe the lady in the image is from, but the jingle dresses are said to have originated with the Chippewa tribes. The rows of metal cones are called ziibaaska’iganan in the Chippewa language. The Chippewa, also spelled “Ojibewa”, comprise one of the largest tribes in the northern U.S. and southern Canada. On stage, these three young maidens await the results from the judges. At left is a girl from nearby Nambe Pueblo, and center and right are from Navajo tribes. 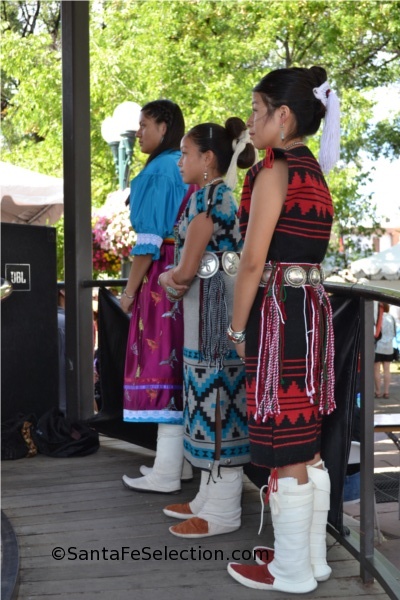 Their dress includes full leg moccasins, silver concha belts, and woven blanket dresses. 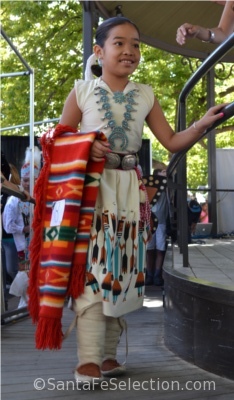 This Navajo girl’s dress with a squash blossom necklace and concha belt, won first place in the “Traditional” category for girls aged 6 – 10 years. Navajo 1st place winner for “Traditional” category. Girls age 6-10 years. I am almost certain that the image below is a beautiful Sioux dress with cowrie shells. Woman’s Dress from a Sioux Tribe. The contestants await the results from the judges on the Santa Fe Bandstand stage. 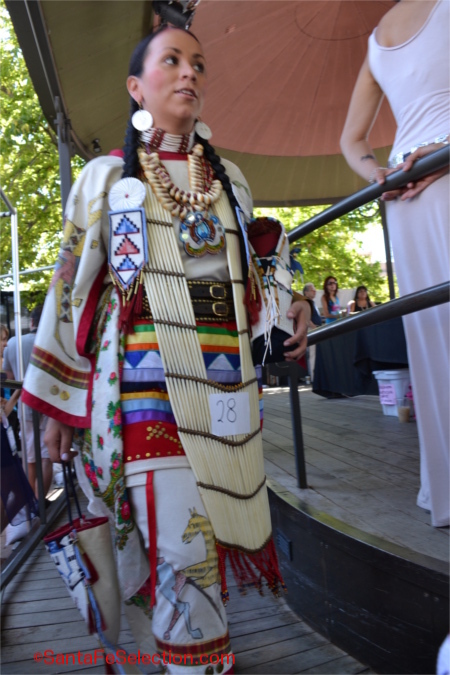 The opportunity to see more of these wonderful displays of wearable art happens this weekend at the annual SWAIA Indian Market. Every August, usually the third Saturday and Sunday, this hugely popular market draws over 100,000 visitors to Santa Fe. It is wise to book lodging well in advance. The traditional clothing competition event takes place at the Plaza Bandstand amid the festivities and stalls of amazing prize-winning Indian art, on Sunday August 20, 2017 from 9am – noon. Thank you for reading this article, and if you have any information as to names of tribes on the images above, I’d love to hear from you. If you’d like to receive my monthly updates, please sign up for my blog at this link. June 3rd & 4th – Spring Festival & Fiber Arts Fair. 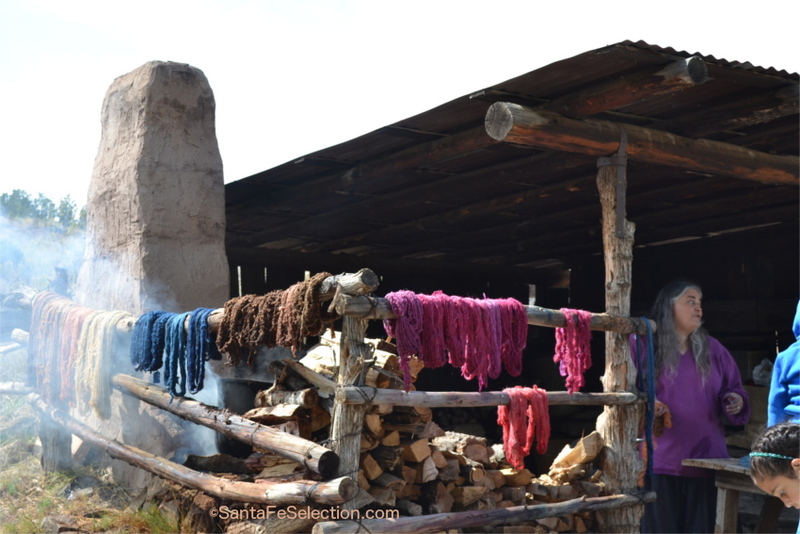 Authentic Wool Dyeing at Las Golondrinas. Come see what life was like on the Camino Real, Santa Fe Trail and Spanish Trail. Learn about the people, goods and livestock that came and went on the arteries of the Southwest. Also, experience traditional ranch activities like sheep shearing, wool dyeing, spinning and weaving. Plus a fiber arts marketplace, bread baking and crafts for children! June 17th & 18th – Herb & Lavender Festival. Visit lavender and herb product vendors and enjoy lectures and hands-on activities on all things lavender. Visit the marketplace to shop great treasures from over 20 vendors selling handmade soaps, lotions, essential oils, art, food, plants and more! July 1st & 2nd – 24th Annual Santa Fe Wine Festival. Celebrate summer with handmade wines from the New Mexico Wine and Grape Growers Association. Taste mouthwatering food, dance to live music, buy unique arts and crafts, and explore New Mexico’s history at Santa Fe’s longest running wine festival. July 22nd & 23rd – 10th Annual Viva Mexico. Revel in the music, culture, food and art of Mexico for two days. Re-discover our neighbor to the south as you listen to mariachis, shop in the Mercado and eat delicious food prepared by local Mexican chefs. Our shared histories and cross-cultural influences are undeniable at Viva Mexico! NEW in 2017: August 5th & 6th – Panza Llena, Corazon Contento: New Mexico Food Fest. Explore the food history of New Mexico at El Rancho de las Golondrinas. Step back in time, as you taste your way through the history of the Land of Enchantment. Experience historic methods of food preparation, learn from food historians, attend workshops, sample delicious locally-made creations and find something special from the many vendors and artisans. Make connections to New Mexico’s contemporary culinary scene and be the judge of an epic food truck war. August 19th & 20th – Adventures in Territorial New Mexico. From Civil War battles to Old West shootouts, experience the adventure of Territorial New Mexico! Taste some grub from the back of a chuck wagon and listen to songs of the vaqueros who once drove cattle across this vast land. Visit soldier encampments, watch the blacksmith hard at work and meet amazing ladies from these rough times. Sept 2nd and 3rd – Fiesta de los Niños. 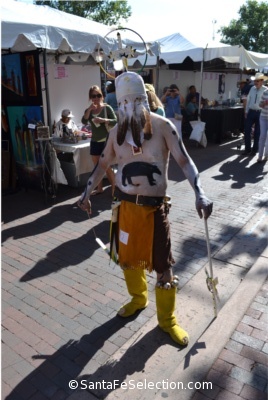 September 16th & 17th – The 10th Annual Santa Fe Renaissance Fair. Renaissance Fair – Dressing the part of Royal Attendees. Travel back in time with Clan Tynker and the Order of Epona jousters. 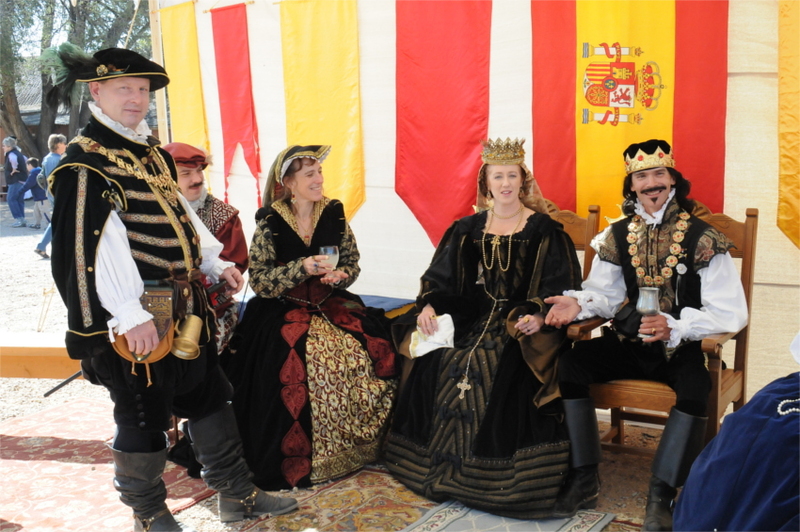 Go on a knight’s quest to meet Queen Isabella and King Ferdinand. Ride in a Spanish Galleon at our kids game area. Learn about Renaissance arts and sciences from the SCA. Shrink in size as you enter the Fairy Village and pet a unicorn. Enjoy incredible performances and music, delicious food, and arts and crafts vendors at New Mexico’s premier Renaissance Fair. 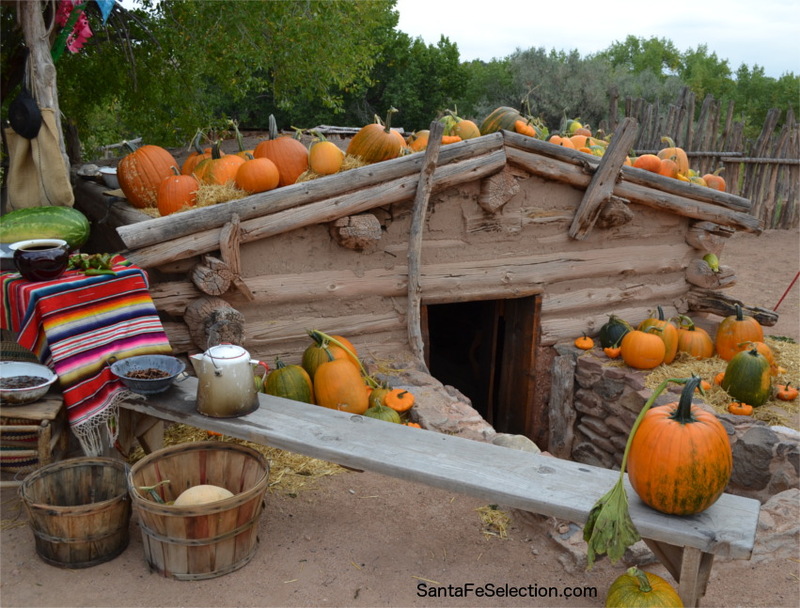 The root cellar at El Rancho de Las Golondrinas during Harvest Festival. Ranked in the top 3 Harvest Festivals in the U.S. Autumn is a vibrant time to visit El Rancho! Taste syrup from the burro driven sorghum mill, help make cider by cranking a traditional apple press, and pick a pumpkin from our scarecrow-guarded patch. Children can stomp grapes by foot, make cornhusk dolls or roll their own delicious tortillas by hand. There’s a lot to do at this long-running and acclaimed event! NEW: Oct 28th – Halloween Event “Spirits of New Mexico’s Past”: Meet the ghosts of history who lived and died in the land of enchantment! 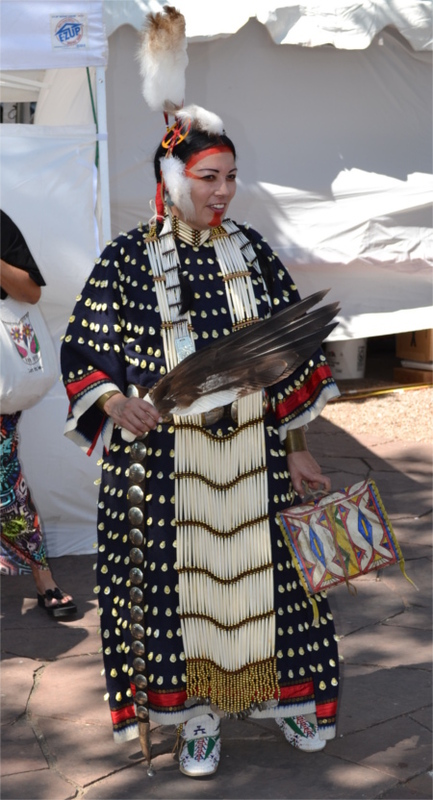 Step back in time and encounter a diverse assortment of characters from New Mexico’s illustrious and often little known past. Listen to their amazing stories and experience intriguing bygone events. Lit by lantern light and campfires, our wondrous historic site takes on a family-friendly but spooky Halloween atmosphere. There’s something for everyone at El Rancho de las Golondrinas. Pick your fun and plan ahead. 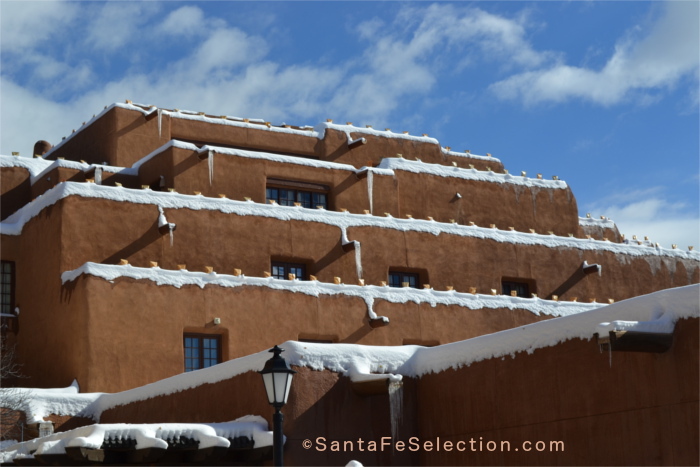 To book your lodging at special discounted rates, or for help with planning the ideal vacation in Santa Fe, go to SantaFeSelection.com or call (505)470-2991. Thank you for reading my blog. If you’d like to receive my monthly articles, please sign up here. 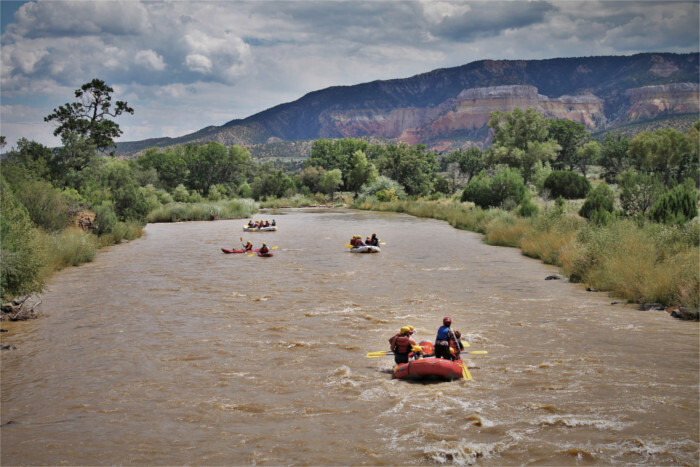 I am pleased to welcome New Mexico River Adventures to our Santa Fe Selection Travel Guide. 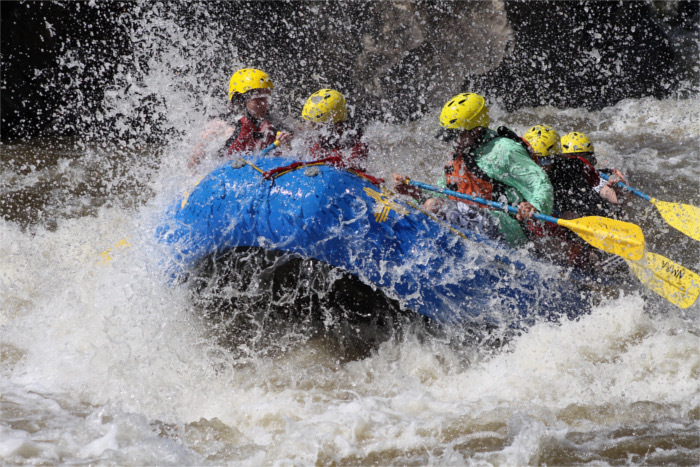 The rafting season is here, and riding our beautiful rivers with expert guides is the perfect way to enjoy New Mexico with friends and family. This 2017 rafting season is shaping up to be the best in recent years. 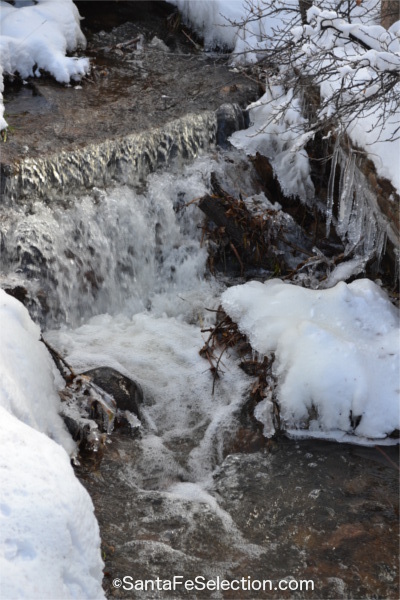 We have received a healthy snowpack in the Sangre De Cristo mountains, which will lead to a long and wonderful run-off on the Rio Grande and Rio Chama. Water levels fluctuate throughout the season with the highest flows historically coming the last week of May and the first two weeks of June. Fortunately, the Rio Grande has fun, “runnable” flows all season long. For the thrill seekers, the Taos Box and Razorblades trips are optimum in May and June. The Taos Box is New Mexico’s premier whitewater run and in the top 10 best single day whitewater trips in the United States. Our full day trips are also known for their excellent riverside lunches, serving up delicious, fresh, hot fajitas! 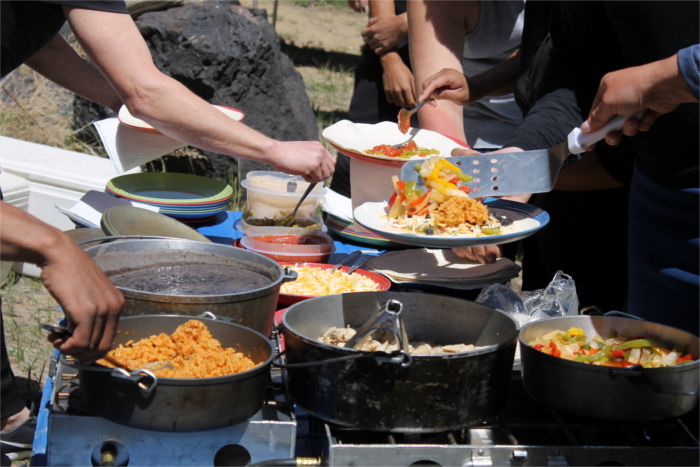 Delicious Fajita Lunches by NMRA on their full day trips. For those in search of slightly calmer waters that are suitable for younger kids and families, the Rio Grande Gorge Full Day, Half-Day Racecourse, and Orilla Verde Float are always great options throughout the season. We can accommodate children as young as 4 years old. On the Racecourse morning and afternoon trips are available. Our snacks on the half-day trips have been family tested, and our guests claim them to be the perfect mid-trip refreshment, with fresh fruit, chips and salsa, and cookies to satiate any growling bellies- so you can concentrate on having a good time. On the Orilla Verde Float, you can spot mule deer, river otter, beaver, birds of prey and other wildlife. You’ll float through the historic village of Pilar, and one of the most scenic sections of the canyon. The best time to enjoy Stand Up Paddleboarding is from later in May all the way through September. 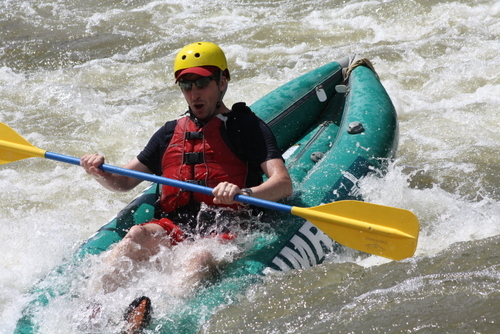 The water levels and the warmer weather are ideal for this fun and exciting new river sport. Stand Up Paddleboarding is a very popular sport. We offer a number of customized and specialty trips. One of our most popular specialty trips is with our partner, New Mexico Wine Tours, called Whitewater and Wine Tasting Day Trip. Your day will start off with New Mexico Wine Tours picking you up from your hotel, home or wherever you’re located, and taking you directly to our Rafting Headquarters. After your half-day river adventure, you’ll freshen up at our headquarters, and then you can wind down as New Mexico Wine Tours takes you to our top boutique wineries, such as Black Mesa Winery and others located in the lower Rio Grande River Valley. It’s a wonderful way to spend the day! For the gourmet river adventurer, we have a couple of different multi-day trips on the Rio Chama that will leave you breathless and satisfied. Both our Gourmet Wine-Pairing Trip (with Vivac Winery and Chef Rocky Durham of Blue Heron Restaurant) and our Beers & Cheers Trip (with Bosque Brewing Co.) offer on-river tasting and dining experiences unlikely to be found anywhere else. Essentially, it is cruising on the river with a gourmet eatery and tasting room. The 2017 Gourmet Wine-Pairing Trips have all booked up already, so you might want to get in touch for 2018s. When conditions permit, the Rio Chama Full Day Trip is a wonderful excursion with mild rapids and towering sandstone canyon walls. Dam regulated flows make for excellent late summer Chama rafting too. 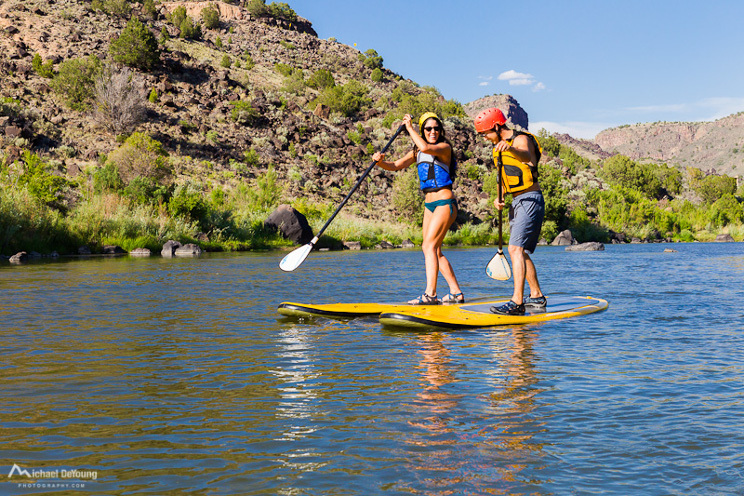 Throughout the season, we offer a variety of dates for the most pristine wilderness river trip in New Mexico, The Rio Chama Three-Day Adventure. All the while, our knowledgeable guides make sure all your needs and comforts are met. 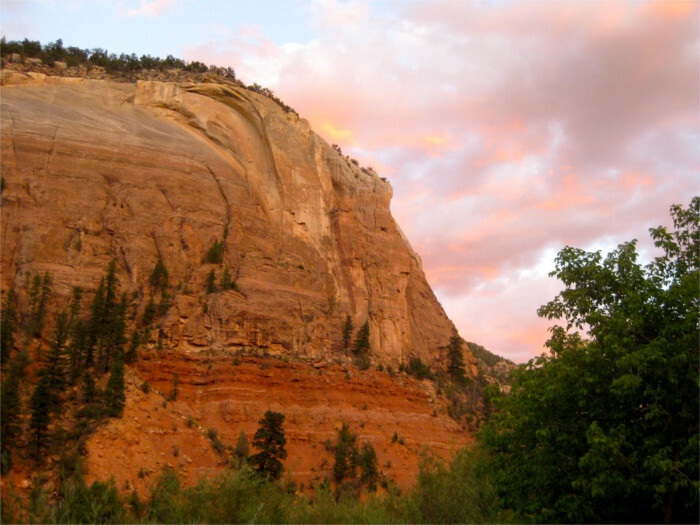 Multi-day excursions along the Chama. 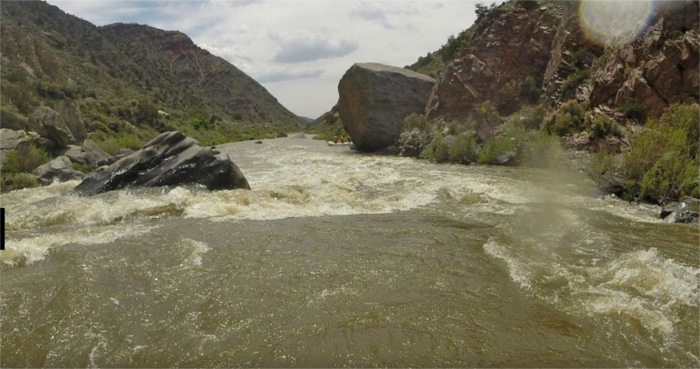 When the water levels are lower, later in July, August and September, it’s optimal for our inflatable kayaking trips on the Racecourse, and Rio Grande Gorge full-day trips. Our expert guides know where all the best splashes, swimming spots, and hidden gems of the river are. Inflatable float and whitewater kayaking is available with classes for all ability levels. 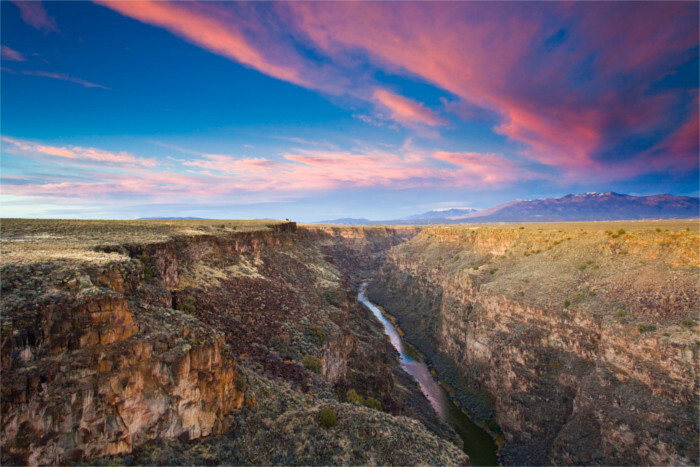 The easy, 45 minute scenic drive up from Santa Fe to our headquarters in Rincoñada, along the Rio Grande, offers stunning views of Black Mesa at the bottom entrance to the Rio Grande Gorge. 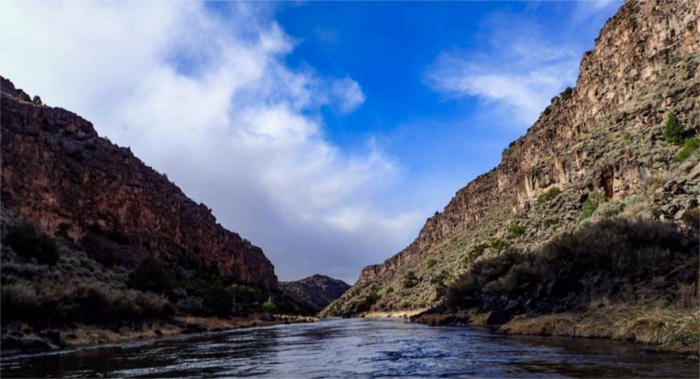 Getting on the river is an excellent way to experience New Mexico. 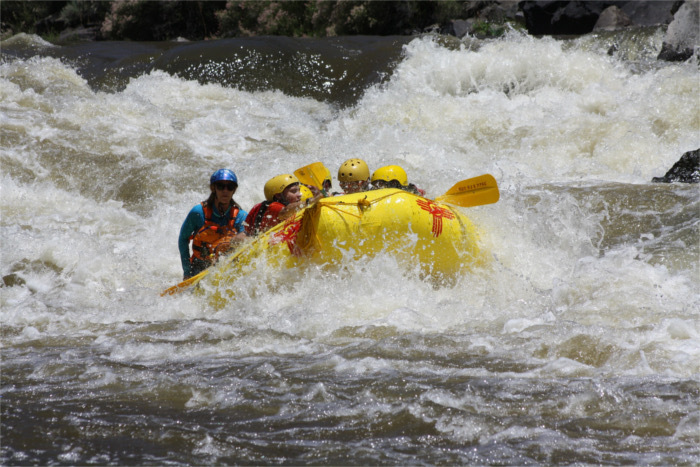 For New Mexico River Adventures outing details, and to book your trip, click here or call (800) 983-7756 for details. Remember to mention Santa Fe Selection when you call. 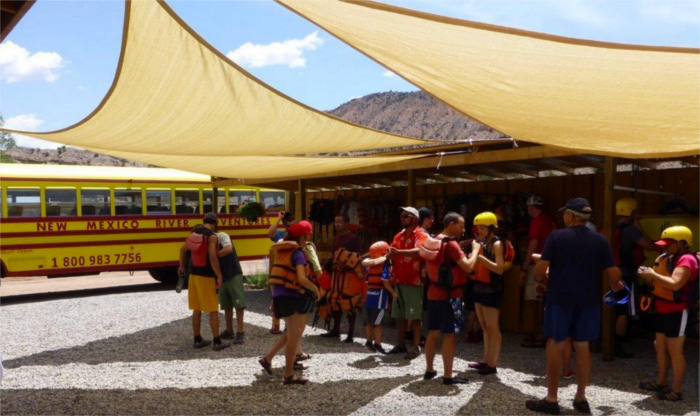 New Mexico River Adventures is offering 10% off with Promo Code: RAFTNM. Thank you for reading our blog article. If you’d like to receive our monthly posts, please sign up here. If you really want to get away from it all, unplug, relax and immerse yourself in something fun and rewarding that taps into your creativity, then Santa Fe Art classes and experiences are a must. Whether you’re going solo, or with family, friends, or coworkers, there is a local art scene that welcomes you into professional artists’ studios to explore your inner creative landscape. Leave your inhibitions behind and get down and dirty. Novices and experts can enjoy a variety of media, including clay, acrylics, pastels, watercolors, oils and found objects. 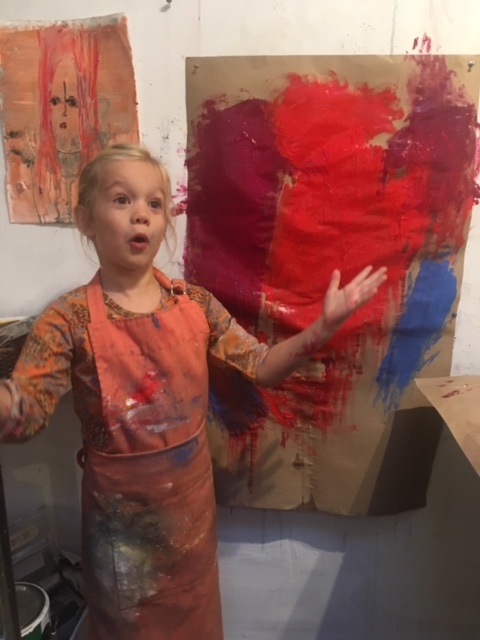 A young artist tapping her potential at Lauren Mantecon’s Studio. I recommend three local, award-winning artists and teachers I’ve enjoyed working with who will provide the space, materials and guidance to facilitate your creative process. You just bring your curiosity and willingness to make the kind of colorful mess that could lead to meeting your artistic self. When I tried this, I was hesitant to make a sorry mess that would look horrible. But I soon found it liberating to feel there are no restrictions or expectations. Actually, “messes” are encouraged and can blossom into thought-provoking works of art. Lauren Mantecón of Art Alchemy and Mantecón Studio has been opening doors of creative perception for curious creators for over 20 years. She has shown her works of contemporary art at top galleries and museums around the country and in Mexico. 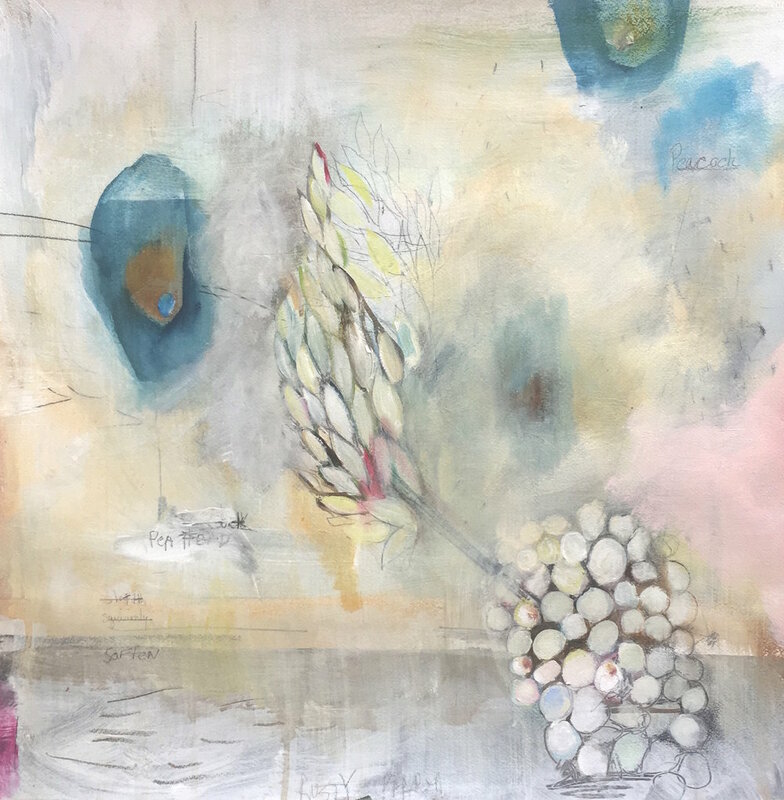 Many of her students have become artists in their own right, and they continue to return for refresher workshops that add dimension to their work. In a lovely quiet neighborhood near downtown, Lauren’s light-filled, spacious studio has everything you need to enjoy a few hours of painting fun. With a few simple questions, Lauren helps you tap into your unique style. Her classes range in size from 5 to 12 people, and she offers customized classes for small groups, families and individuals. Group Class at Mantecon Studio. Lauren offers workshops that range from full day to multi-day, or week-long retreats. And she often invites guest artists from around the country to teach their unique styles and impart their expertise. Lauren also offers an Open Studio class one day a week in the winter and spring, and two days a week in the summer and fall. Click here for more info on rates and dates etc. Prices start at $55 per person + tax for drop-in Open Studio classes, and $185 for 2 hour private classes, with $50 per additional person. All materials provided. To book your class with Lauren call (505) 428-9469. And remember to mention Santa Fe Selection. Anita teaches pastels, oils, acrylics and watercolors. She offers realism, impressionism and contemporary classes. You can work with her in her own studio in the downtown historic district, or meet on location for a “plein-air” class in town, or a little off the beaten path for more landscape vistas (weather permitting). 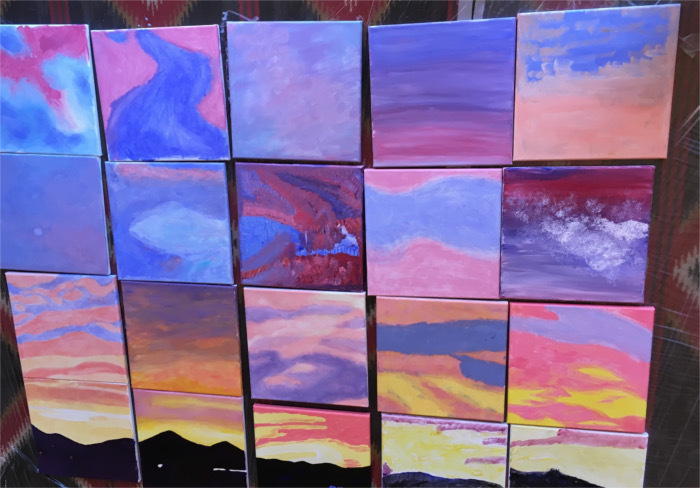 In addition to working with individuals and families, Anita has developed her Team Building Art Experience, which many corporate and large groups have enjoyed. Anita’s Team Building process elicits the play of creativity with a sense of fun collaboration, sharing and letting go. Everyone starts and ends with their own work, but during the process, the piece gets passed around, and the collaboration begins. The culmination is a work that combines to create a beautiful collective piece, and individual works that stand alone. Ultimately, everyone gets to take home their original work as a memento. Collective sunset – Teambuilding with Anita West. Anita also teaches an open studio class in her downtown studio on Thursdays: 9am – Noon, and 1pm – 4pm. You can stay for the half-day or all day. Call (505) 577-0113 for rates, location details, and to reserve a spot. Prices start at $125+tax per person for a 3 hour class. All materials provided. Group rates are available. Mention Santa Fe Selection when you call. 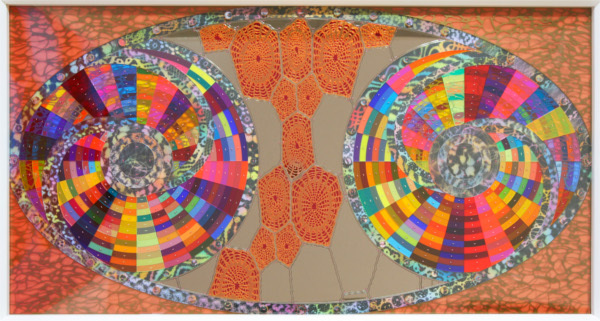 Group Work Display – Anita West. 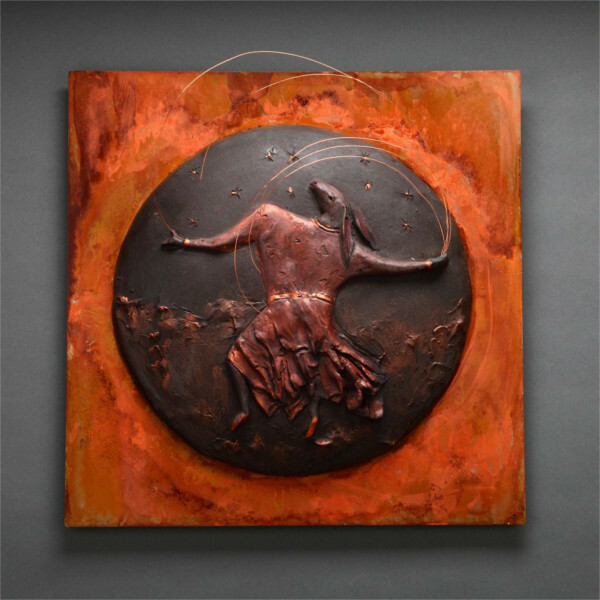 The Rabbit Princess Dances with Fire – Clay Tile. ©Ginny Zipperer. Ginny Zipperer has been an established Santa Fe potter and clay artist for more than 40 years, and has won awards for her unique works. Ginny’s professional pottery studio is in the Baca Street art district, within the Railyard neighborhood area. She does have a pottery wheel available as well as many other methods for clay creations. 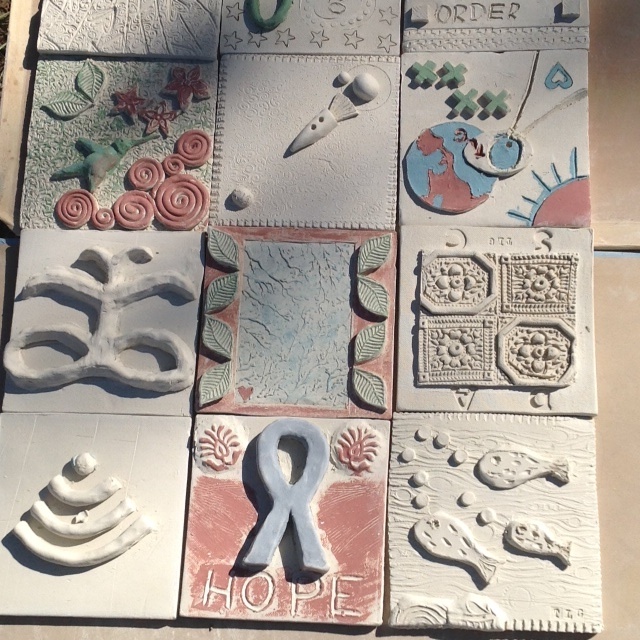 Team Building with Clay Play provides a unique opportunity for professional groups to step away from the analytical and into the creative. 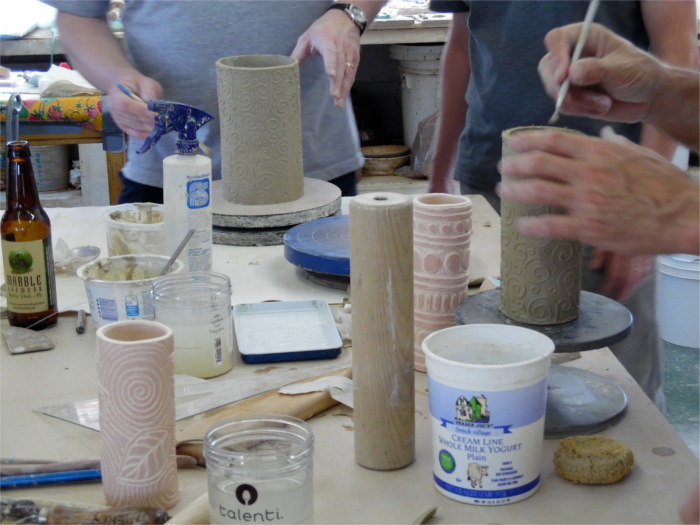 Participants engage with the clay and each other in a physical, light-hearted environment. Through this workshop, they gain new perspectives on their business work environment, shift group dynamics and enhance group identity. Ginny loves to teach groups and individuals, families, and kids (with accompanying adult). Prices start at $190 +tax for up to 3 people for up to 2 hours. Includes all materials and shipping of your fired piece. To schedule a class, call (505)204-6236. (Mention Santa Fe Selection). The light, vistas, and culture in New Mexico have been a source of inspiration for artists for centuries. Santa Fe is one of the top art destinations in the United States – well worth the trip to visit over 200 world-class galleries that range from modernism greats to ancient artifacts. 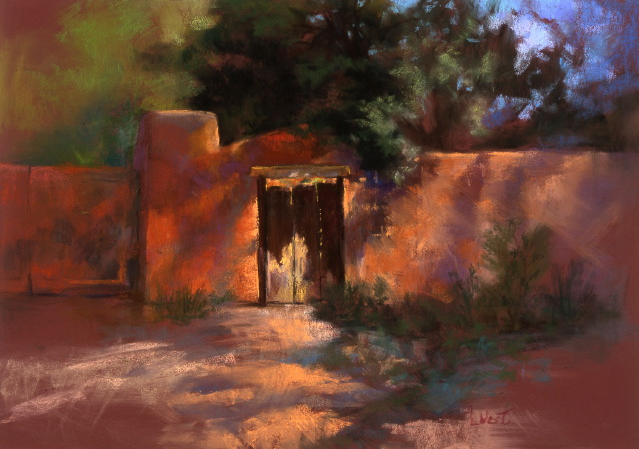 A visit to some of Santa Fe’s galleries can help inspire your inner creator. It might be a bit daunting to know where to begin and which galleries will most appeal to your tastes and interests. Elaine Ritchel of Santa Fe Art Tours offers wonderfully immersive guided tours of the top art districts in Santa Fe, including Canyon Road, The Railyard Arts District, and the Plaza area. Elaine’s expertise and extensive art knowledge helps you to experience the art more completely. It might triggers your inspiration for a later visit to a studio. As with all classes or tours, it is important to give advance notice so that the facilitator can prepare. Sometimes artists may be available on the spur of the moment, but it is helpful to give at least 24 hours notice, if possible. If you and your friends, family or co-workers are looking to have fun together while tapping the source of your inner artist, and have a memento of your time here, then this is something you’ll want to experience. It’s good for the mind, body, and soul. 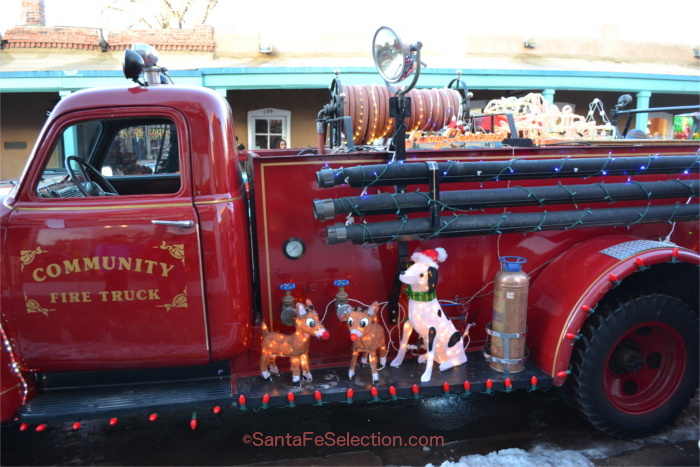 For more information on where to stay, eat, and unique things to do in Santa Fe and Northern New Mexico, please go to SantaFeSelection.com Travel Guide & Concierge. Thank you for reading my blog. If you’d like to receive our monthly articles, please sign up at this link. At Cacao Santa Fe Chocolate Factory and Coffee House, light is being shed on the art and culture of chocolate — from bean to bar, (or elixir) — and many other tasty creations. Immersive experiences are something we all want more of these days, and losing oneself for a couple of hours in the aromatic culinary world of authentic, hand-crafted chocolate is one I’m up for…any time!! 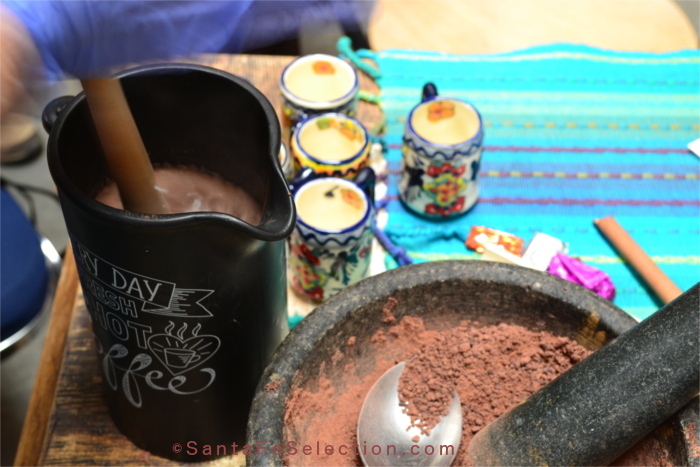 I spent a fun two hours with Cacao Santa Fe’s co-owner Melanie Boudar, in her Food of the Gods Workshop, sipping a delicious elixir and learning fascinating facts about the complex journey of cacao and the careful alchemy this creative process entails. I now see chocolate from a whole new perspective. It’s a minor miracle this stuff ever evolved from the tough-shelled, curiously large, and colorful pods into the delicacy many of us crave. Cacao trees and pods in Hawaii. The name of the substance in chocolate we know as “Theobromine” originated in ancient Greece from the words “theo” meaning god, and “broma” meaning food. And we all know that its wondrous “feel good” effects are simply darn good for the soul! 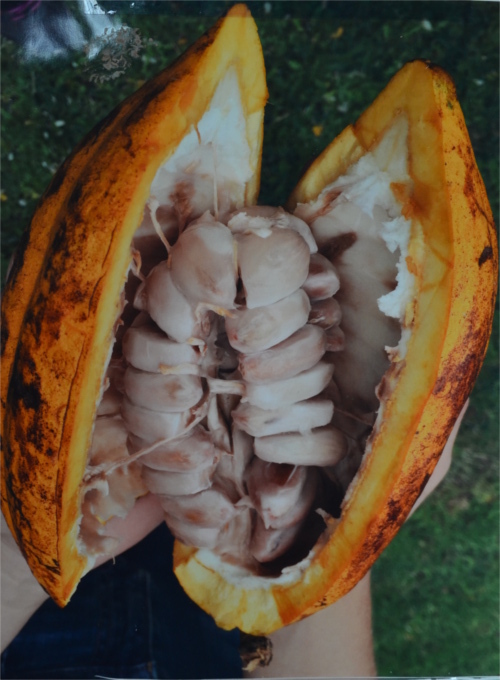 Inside a cacao pod there’s a fibrous fruit, the bean is within the fruit. Melanie Boudar is an award-winning chocolatier. She traveled extensively in Latin America, working on cacao farms cultivating and harvesting the beans. 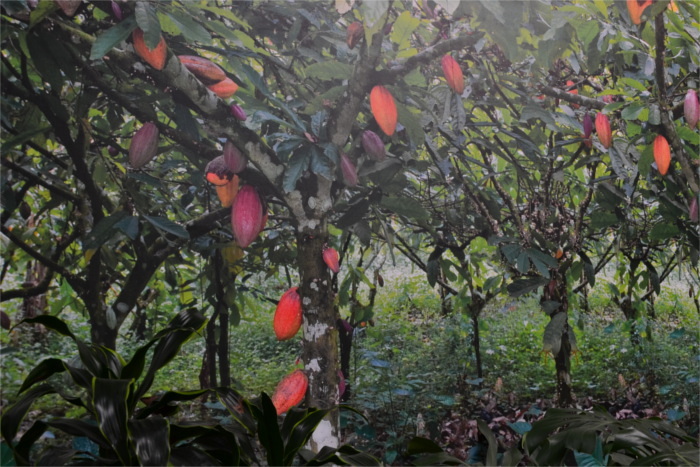 She learned first-hand about the origins of chocolate, the sensitive balance required for the ideal growing environment, its chemistry and highly important fermentation process. Like a fine wine, chocolate offers many varieties of flavor, aromas, textures, and subtle back notes, which are influenced by the culture of its region of origin. 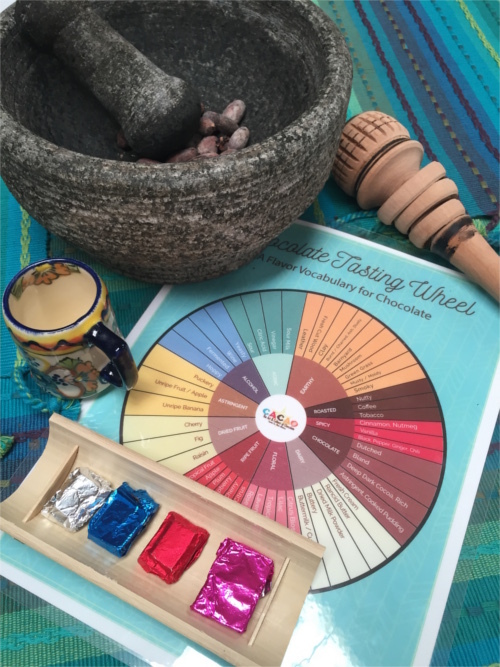 In the workshop, you’ll take a “flight” around the Tasting Wheel that includes such exotic locales as Ecuador, Hawaii, Madagascar, and even Vietnam, and back home to delicious Santa Fe. You’ll see, smell and taste the creation of a delicious elixir made fresh just for you. And you’ll understand chocolate on a level you couldn’t have imagined. 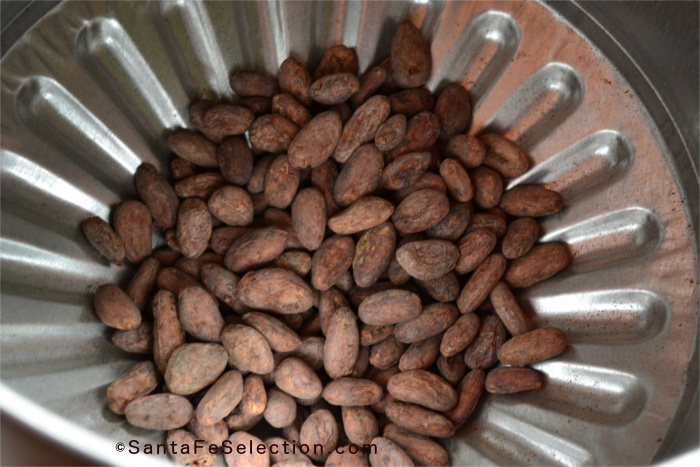 Raw Cacao Beans ready for grinding into nibs. The raw beans are ground up, and the lightweight shells removed, leaving shiny, dark nibs. The nibs are then ground again into something resembling pasta. After the nibs are ground, they look like pasta. After tasting a freshly-made elixir, I can understand why this little treasure was considered currency in some historic cultures, and it is said that it was once instrumental in preventing a battle on our own New Mexican soil. It seems the food of the gods calmed the savage beast. After grinding the chocolate from pasta to powder, Melanie made a deliciously seasoned elixir. Today’s giant brand-name chocolate factories fill their bars with so many additives that the original goodness has been far removed from the sugary candy that has reigned for many decades. I admit I’ve been a chocoholic my entire life, but my exposure to the real deal has me appreciating the intricate process and world culture that puts the authentic works of art at Cacao in a class of their own. In 2008, Melanie started her award-winning Sweet Paradise Chocolatier brand in Wailea, Maui. 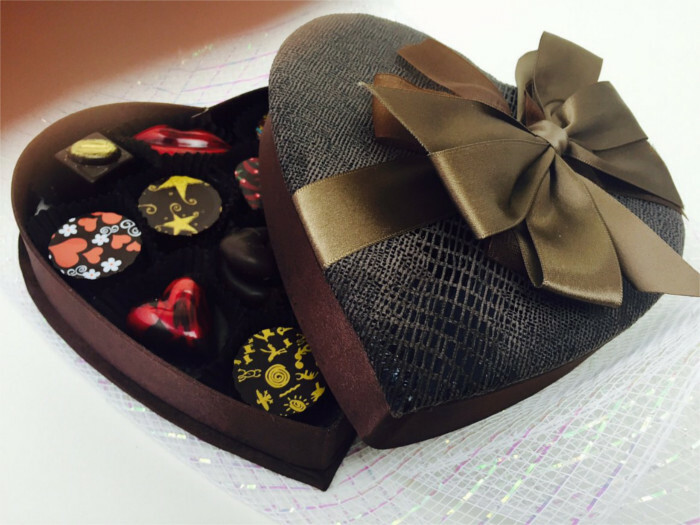 She creates beautiful artworks with a variety of flavor-filled truffles and chocolates. A Special Valentine’s Gift Box of such yummy flavors as Ganela (a rich cinammon ganache with a caramelized milk chocolate), and Piñon Juniper to mention a few. 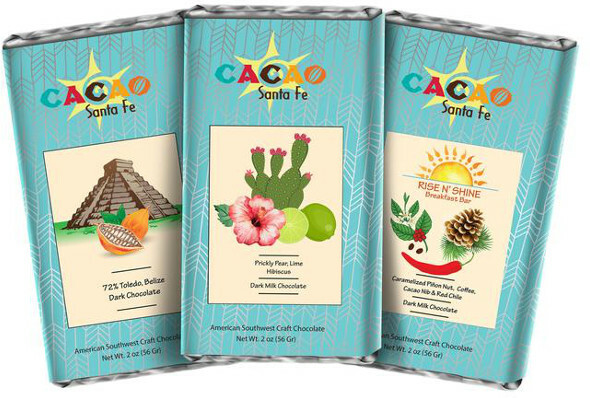 Melanie recently returned to New Mexico to open Cacao Santa Fe, inspired in part by the archeological discovery of chocolate in ancient pottery sherds found in the Chaco Canyon Pueblo ruins. Today she and Cacao’s co-owner, Derek Lanter, help support a group of farms that cultivate cacao trees in Maui, Belize and South America, bringing them to Santa Fe to make into delectables. A Selection of Specialty Coffees available at Cacao Santa Fe. Chocolate’s history is extensive and fascinating, and there’s no one better to tell you about it than native New Mexican Mark Sciscenti, who joined the Cacao team in 2016. 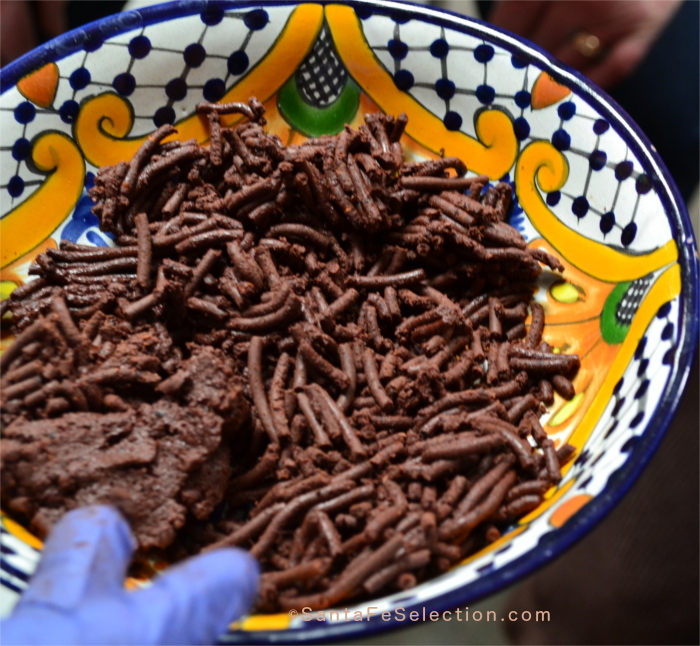 Mark is well known in Santa Fe as a chocolate historian, artisan chocolatier, and pastry chef. His passion for chocolate inspired his founding of Kakawa Chocolate House in Santa Fe in 2005. Mark left Kakawa in 2009. His passion for chocolate remains pure and strong as he offers Chocolate History Classes at Cacao. Mark makes more complex elixirs based on historical drinks using various chiles, fruits and spices from around the world. He also makes many of the special pastry creations available in the Cacao coffee house, such as the dark and delicious flourless torte that held me captive for a while. There’s a careful alchemy involved in the making of world-class chocolate, and the team at Cacao Santa Fe has the gift. They bring unique flavor combinations and artistic creations to the taste buds that linger in memory. One of my current favorites is Hibiscus with Lime and Prickly Pear. Its smooth texture accompanied by a tangy citrus sparkle on the tongue is definitely one I’ve not encountered before, but one I keep going back for. Beans that made the cut all the way to these delicious bars. The farm to table, organic process of chocolate from bean to bar is grabbing the attention of foodies and taste adventurers around the world. 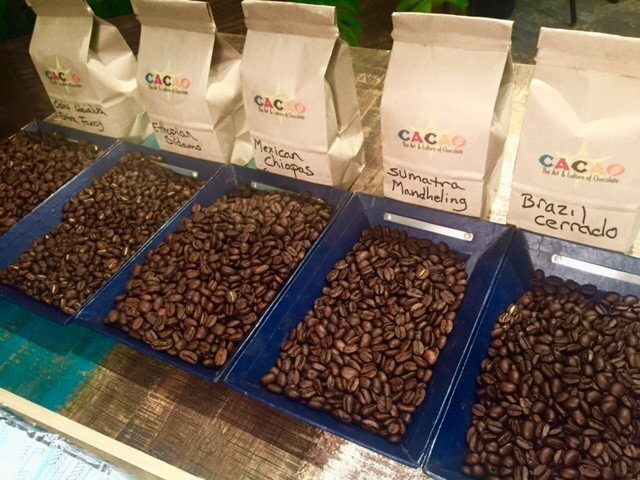 I recommend you make your next adventure a fun one that stimulates the taste buds and feeds the soul at Cacao Santa Fe Chocolate Factory & Coffee Shop. The shop is filled with a wide variety of goodies for sale, the coffee shop always has delicious elixirs, desserts, coffees and more. They offer a number of workshops, tours, and tastings for groups and individuals. The pricing is approximately $35 – $59 per person (depending on the class), with discounts for seniors and children 8 – 12 years-old. You can find their schedule here and book through this link. Thank you for reading my blog. If you’d like to sign up to receive our monthly articles, please click here. 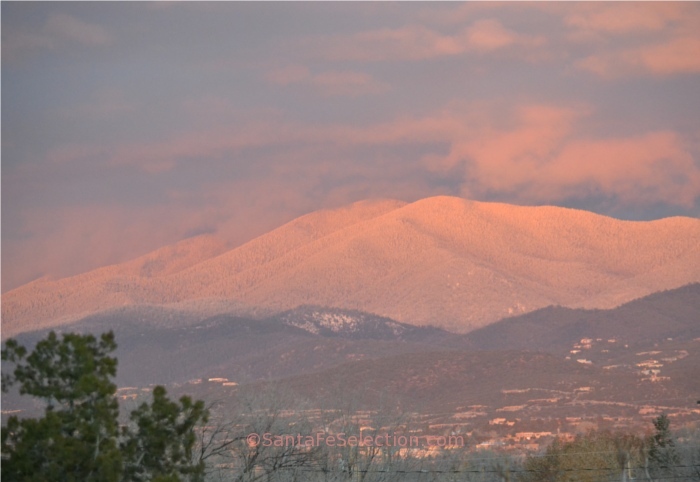 For more information on Santa Fe, where to stay, and things to do, go to: SantaFeSelection.com Travel Guide & Concierge. David Richard Gallery has been a must-see art experience since it began in 2010. David Eichholtz and Richard Barger have created extraordinary, immersive exhibits at their expansive 4500 square foot space in the innovative Midtown area of Santa Fe, at 1570 Pacheco St, suite A1. David Richard Gallery is known internationally for its museum-quality exhibits. It has been ranked as one of the top galleries in the U.S, and in the top two in Santa Fe by the international art news source Blouinartinfo.com. Historical and contemporary works are featured by many renowned artists, with a focus on post World War II art movements from the 1950s to the present, including Minimalism, Abstract Expressionism, Conceptualism, Pop Art and Op Art. 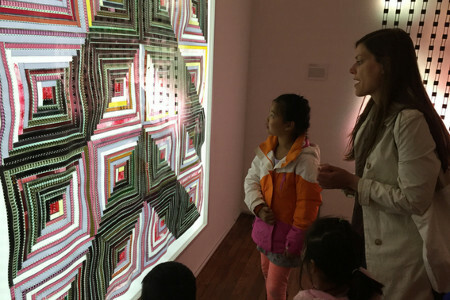 They have shown works by such greats as DeKooning, Judy Chicago, Tamarind Institute founder and lithographer June Wayne, Washington Color School and Color Field artist Thomas Downing, and many more. With as many as twelve shows a year, there is always something fresh and exciting at David Richard Gallery. A favorite of mine is Op Art. In the 1950s, artists began creating the optical illusion of movement on a two-dimesional surface using abstraction, pattern, contrast and line. 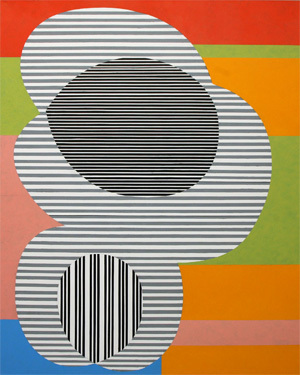 These works “excite” the eye and stimulate the mind. The name “Op Art” was coined in 1965 from a review of the work of Julian Stanczak at the critically acclaimed exhibitions, “Vibrations Eleven” at the Martha Jackson Gallery, New York. 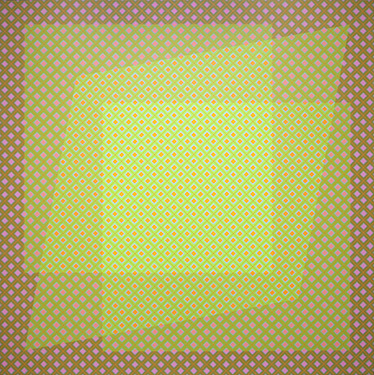 Stanczak was also included in the seminal exhibition, “The Responsive Eye” at MOMA in New York City, which is often credited with ushering in the Op Art movement. January 2017, David Richard Gallery brings you the exhibit “Altered States: A Psychedelic Legacy”, which is now showing Stanczak’s work along with other renowned “Responsive Eye” artists, such as Richard Anuszkaiwicz and Oli Sihvonen. Oli Sihvonen (1921 – 1991) was born in New York, but is known in New Mexico from his years living in Taos in the 1950s – ’60s. David Richard Gallery is the exclusive estate representative of Sihvonen’s work. Oli Sihvonen – Fugue (004), 1988. Oil on canvas. 90 x 72 in. 229 x 182 cm © Oli Sihvonen, courtesy David Richard Gallery. Daniel McCoy, Jr. New Jams New Jewelry, 2014 Acrylic on canvas 48 x 40 “ Copyright © Daniel McCoy, Jr. Courtesy David Richard Gallery, LLC. These works draw you in and envelop your mind when you experience them first hand. Copyright © Heather McGill. Courtesy David Richard Gallery, LLC. David Richard Gallery has been pivotal in helping the Santa Fe art scene to thrive, and in developing the opportunities for local New Mexico artists to gain acclaim. In 2016, they began The Santa Fe Art Project, a collaboration of David Eichholtz’ expert curation and as many as 50 local artists, and six guest curators. This eight-week-long art event, held in the fall, draws attention to the “cutting-edge” contemporary side of the current local art scene with immersive exhibits and interactive events. But that’s just the beginning. With fresh exhibits each month, there is so much to learn and experience, making David Richard Gallery a must-see for visitors and locals. Thank you for reading my blog. To receive our monthly updates and insights, please sign up at this link: Blog Sign Up. & A Healthy, Prosperous New Year!! Christmas Eve Canyon Road Farolito Walk – photo by Katharine Egli. My sweet girl – 2001 – April, 2016. She “lurved” the snow. 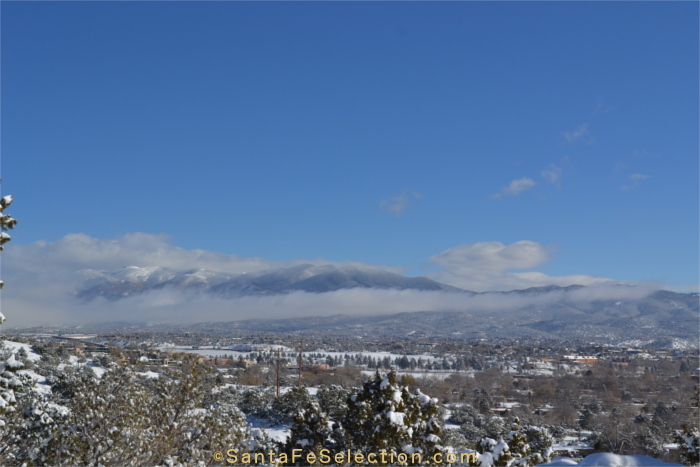 GOMO Santa Fe -There’s So Much to Do! In honor of the trending #GOMO (Going Out More Often) and to help defend against #FOMO (Fear of Missing Out), it’s mid-September and Zozobra and Fiestas are over, and you might think that the summer is winding down and fall is the time when you curl up and anticipate shorter days and colder weather. 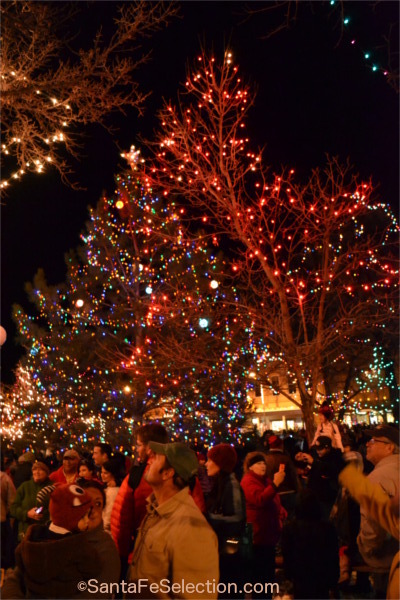 But, think twice, because New Mexico is still getting busy with fun traditions and annual events, so don’t hibernate just yet. The aroma of roasting chiles fills the air, the leaves are turning into gold, and the weather is gorgeously crisp in the mornings and warm throughout the day. It’s the time when the sky is that particularly deep New Mexico blue. There’s so much to do during fall that it’s become the most popular time of year to visit. 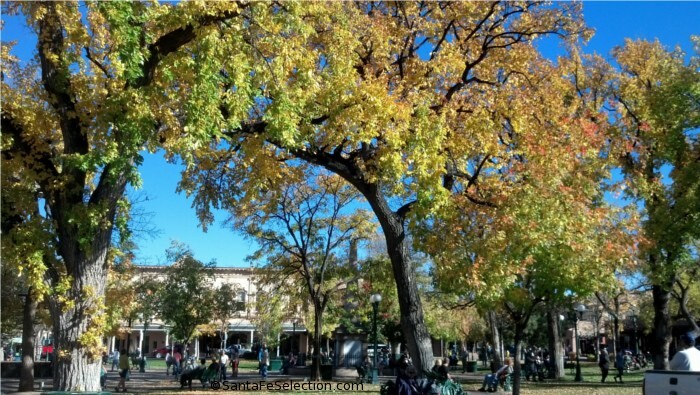 Santa Fe Plaza’s Fall Colors. These are some of the most popular and fun annual events happening in and around Santa Fe in September and October. September 17 & 18, and 24 & 25, 2016: The High Road Studio Arts Tour. 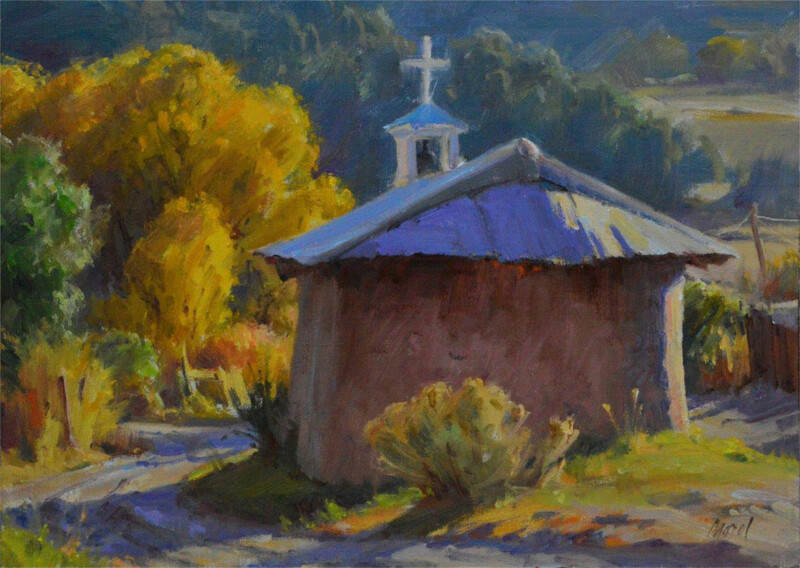 Always the last two weekends in September, folks head out along the scenic High Road to Taos to see the foliage in its autumn glory, and discover wonderfully creative art at over 40 private artist studios and galleries en-route through quaint historic villages. See this link for maps and more info. Painting by High Road Artist: J. Chris Morel. 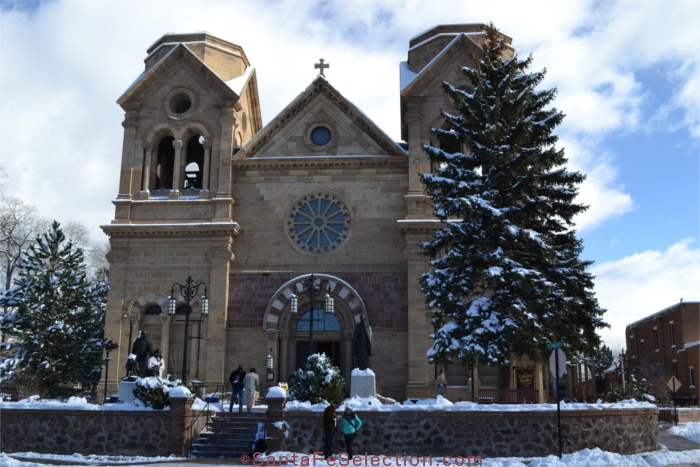 September 17 & 18 and October 1 & 2, 2016: The Santa Fe Artists Market adds the Cathedral Park at St. Francis Basilica, just one block from the Santa Fe Plaza, as a second popular location to its ongoing market that runs May through December. It’s usual Saturday market will also be at the Railyard. Explore beautifully creative artworks by as many as 100 local, juried artisans. September 17 & 18, 2016: The Renaissance Fair at El Rancho De Las Golondrinas. Two days of fun events take you back in time to celebrate the history and culture of the area. September 21 – 25, 2016: For more than 26 years, The Santa Fe Wine & Chile Fiesta has attracted foodies from all over the globe, and those of us who just LOVE eating and drinking. Enjoy a five-day culinary adventure of events, featuring as many as 75 local top restaurants paired with up to 90 national wineries. 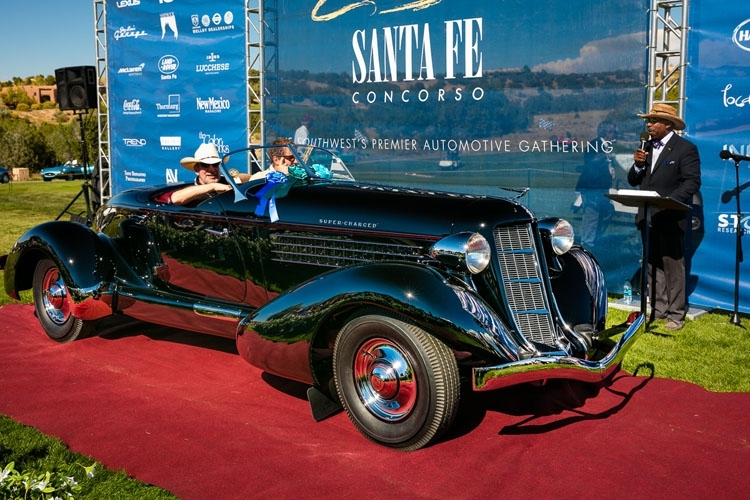 September 23 – 25, 2016: The Santa Fe Concorso has grown quickly in just a few years to become a national treasure of an event. It is now the Southwest’s premier gathering of more than 100 rare and exotic cars and motorcycles. This three-day celebration of mechanical motion includes many stars in the field of vehicles, and world-renowned celebrities of the racing world, and culminates with the finale Concorso on September 25th. October 1 & 2, 2016: The Annual Harvest Festival at Rancho De Las Golondrinas. Gather round the historic living museum of Las Golondrinas to enjoy the rewards of harvest. Events, tours, hay rides, grape treading, wool-dyeing, food tastings and lots of fun for the family. 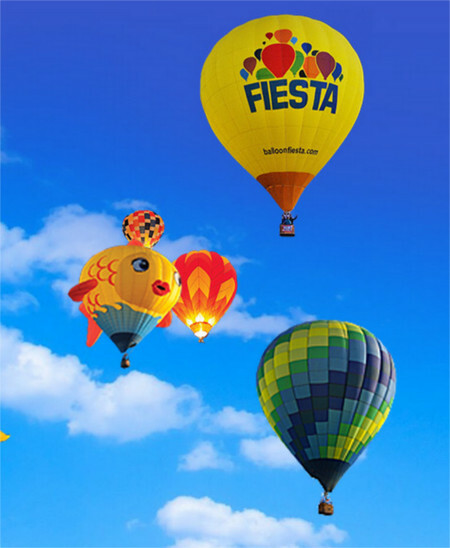 October 1 – 9, 2016: The Annual International Balloon Fiesta – Albuquerque. UP UP and AWAY… Join thousands of balloon admirers for early morning Mass Ascensions, and evening Balloon Glows and so much more at the World’s Premier Balloon Event, just 1 hour’s drive from Santa Fe. For the October 1, 2, 8 & 9th Mass Morning Ascensions, transportation is available from your Santa Fe location, provided by New Mexico Wine & Scenic Tours. It’s a welcome service for the early morning schedule. For $60 per person roundtrip, you’ll be picked up at your Santa Fe location, at approximately 4am, taken to the event, and by approximately 11am, returned to your point of origin. It’s a great deal and saves you the sleepy-eyed drive in the dark. Click here to book your transport. Admission to the Fiesta is $10pp. October 19-23, 2016: The Santa Fe Independent Film Festival began in 2009 as a fringe festival that took place in a community center. By 2011 it was the biggest event of its kind in New Mexico, screening over 100 films during a 5 day Fest. And this is just the beginning. GOMO Santa Fe! Get Out More Often and enjoy the good stuff in the world. 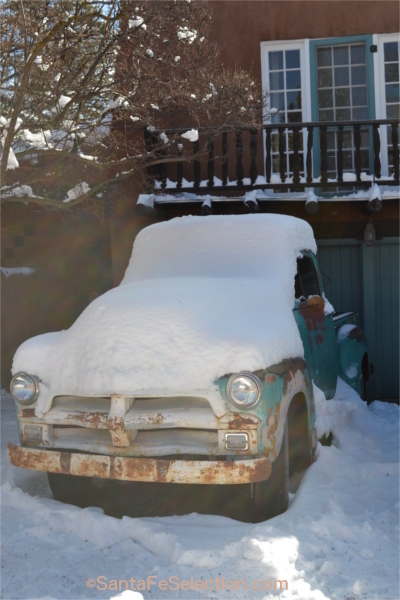 There’s so much of it here in New Mexico, year-round! 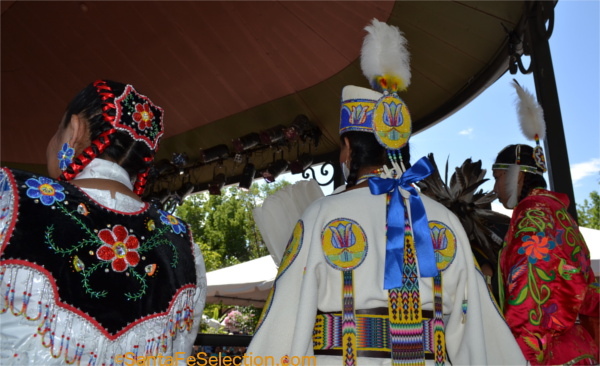 For discounted lodging, restaurants, maps and more info, go to SantaFeSelection.com Travel Guide & Concierge. Thank you for reading my blog. Please sign up here to receive our once monthly articles on the history, culture, and people of this unique Land of Enchantment. 1928 – Zozobra in front of St. Francis Cathedral. 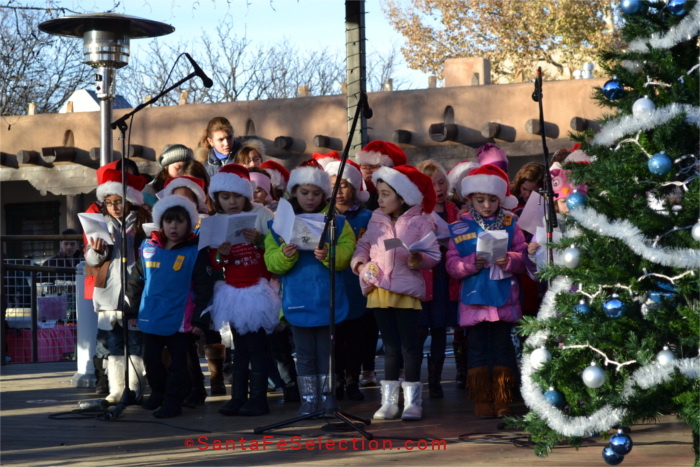 Image courtesy of Kiwanis Club of Santa Fe. 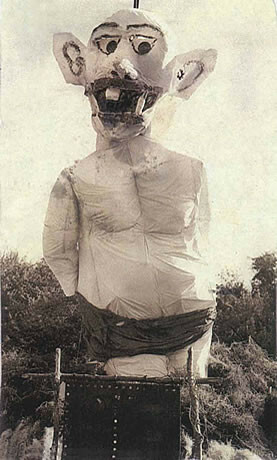 In 1924, he was a six-foot-tall effigy, burned for a private party of artists and writers in Santa Fe. Over the past 92 years, his face and wardrobe have gone through a few changes, but he’s become an iconic figure. He’s also grown to fifty feet tall and weighs approximately 4,000 pounds, making him one of the world’s largest functioning marionettes. Waving arms, rotating eleven-foot-tall head, and enormous, ugly mouth all move to his audible groans of frustration, impatience, and later agony, as the night progresses. 2011 Zozobra and Fire Dancer from a safe distance. Image courtesy of Kiwanis Club SF. Photo by Kelli Abeyta. Zozobra represents all things that rain doom and gloom upon us. He was created as a despicable personality, a “sheep-stealer,” an egotistical, grouchy old geezer – arrogant and evil, whose only aim is to bring misery to the townspeople of Santa Fe. 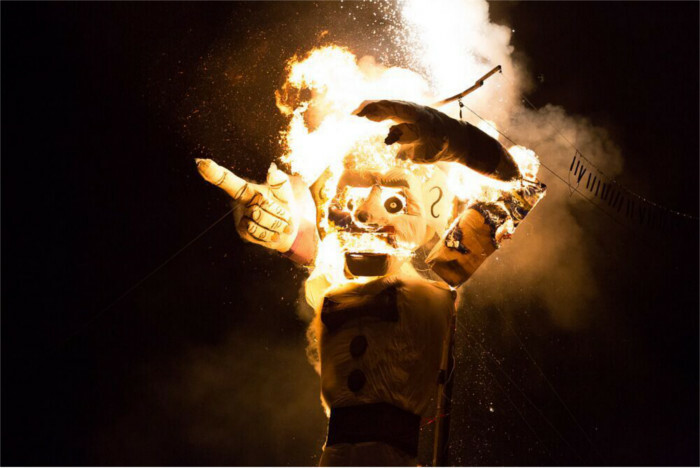 Every year, he thrives on our own sad and gloomy thoughts and feelings as they build throughout the year, then we take delight in burning them along with Zozobra on the Friday of Labor Day weekend at Fort Marcy Park, just a few blocks from the plaza. Zozobra – just as his head explodes. He dies a slow, loud, agonizing death, amid a sea of thundering, effervescent fireworks and explosions, music and cheers of “Burn Him! Burn Him!” from the jeering crowd of thousands – certainly a sight to behold, and one the original creator would have loved. Fort Marcy Park – filled with happy Gloom Busters. In 1923, artist Will Shuster was the man behind the first flames and fiery cheer – with the help of friends, such as renowned artist Gustave Baumann, and the artist community known as Los Cinco Pintores (The Five Painters), which included Fremont Ellis, Willard Nash, Józef Bakós, Walter Mruk and Will Shuster. 1930s image of Will Shuster on the cover of New Mexico Magazine, September 1989. Created by Daniel Martinez, superimposing a 1930s image of Will Shuster, onto a 1989 photograph by Martinez of Zozobra. William Howard Shuster II moved to Santa Fe from Philadelphia in 1920. He was 25 years old. He had fought in France during WWI and suffered from the mustard gas he’d been exposed to in the trenches. His doctor diagnosed him with tuberculosis and prescribed that Shuster move to the mountains of the Southwest as soon as possible, saying that maybe the clean air and lots of rest would extend his life by a few years. After moving to Santa Fe and enduring the boredom of the prescribed “rest cure” for a few months, Shuster began taking walks around the area. He met well-known New York artist John Sloan, and began painting under Sloan’s mentorship. Before long, Shuster was staying out all day and taking his easel and paints with him on strenuous hikes around town and into the nearby mountains. He became a familiar face around town. In social circles, he was known as a colorful, vivacious, honest, outspoken character, with an “every-man-is-a-friend” philosophy. According to Shuster’s personal journals, part of the original Zozobra inspiration began as a means to cheer up his friends while at La Fonda’s bar on Christmas Eve in 1923. Shuster, or “Shus,” saw how gloomy his friends were. They were the quintessential starving artists, and they felt little hope for the coming year’s prospects. Shus wanted to cheer them up, so he got everyone to write their dark thoughts and feelings on a paper napkin. He then proceeded to burn it in an ashtray. Needless to say, they were kicked out of the bar. 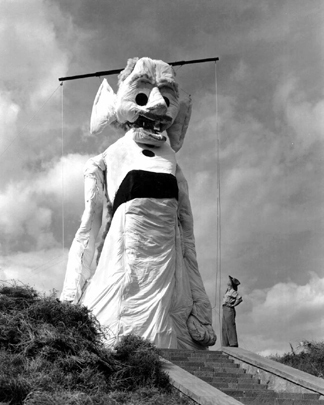 Another key element to the genesis of Zozobra came from a trip Shus took to Mexico where he saw a papier-mache puppet representing Judas, filled with firecrackers, and paraded through town for the Catholic Easter tradition. Shuster decided he wanted to create an event that offered two things: to burn all the demons that haunt our thoughts and moods, and make it a popular spectacle that everyone can enjoy. The first Zozobra burned to a crisp at the end of August in 1924, at a private barbeque party for fellow artists and writers. 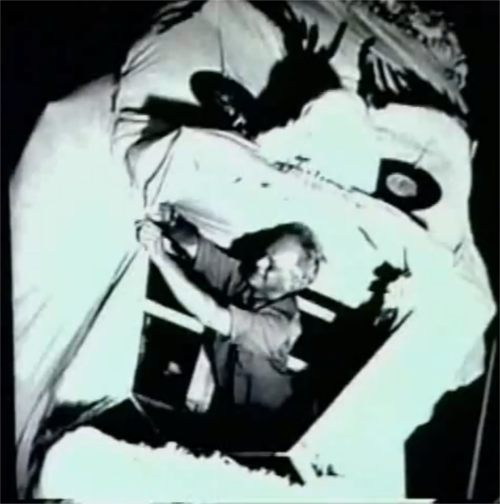 Over the years, Shus continued to work on the puppet, developing Zozobra’s image and character. 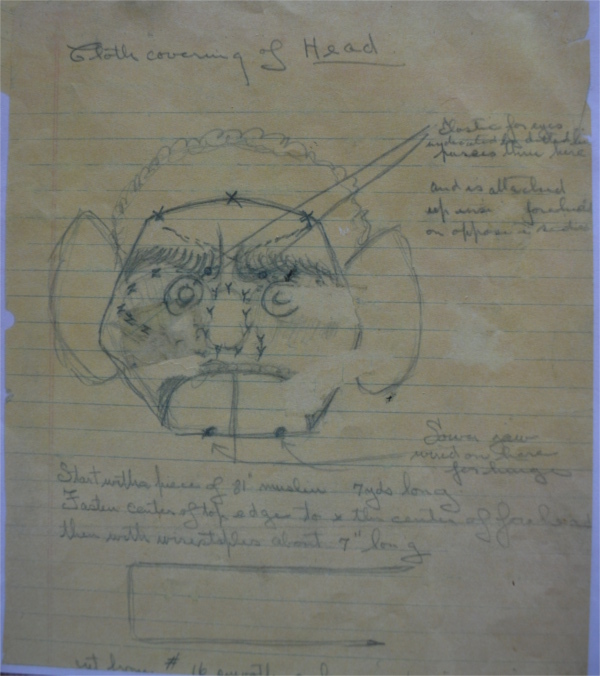 Below is a sketch and notes from his journal of the head. These original sketches and instructions are still used today in the puppet’s creation. Sketch of Zozobra’s Head and instructions by Will Shuster, from Shuster’s Journal, courtesy of Ray Sandoval. Will Shuster in the mouth of his monster. 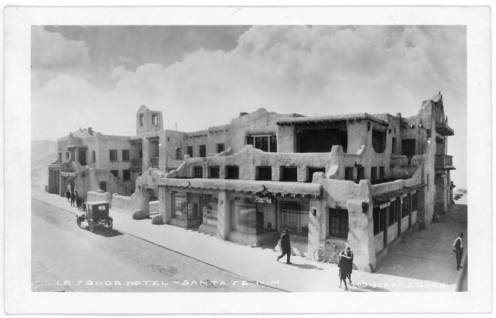 In 1925, Shus approached The Santa Fe Fiesta Council. 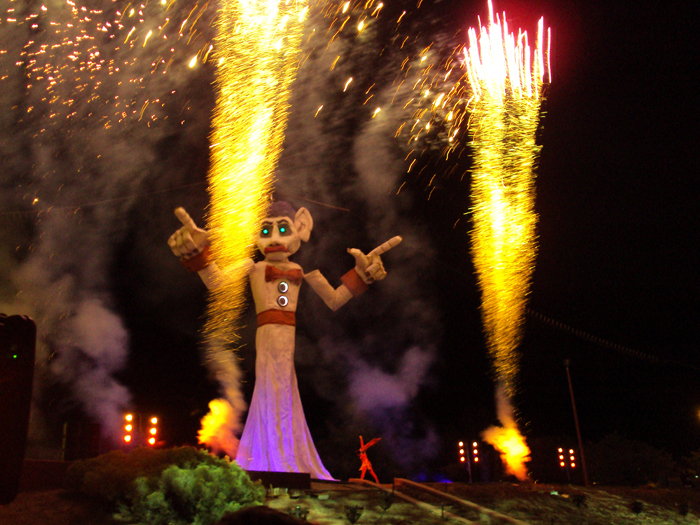 He thought it would be fun to open the Fiesta’s celebrations with Zozobra. But his idea was not well received by the Fiesta Council at first. 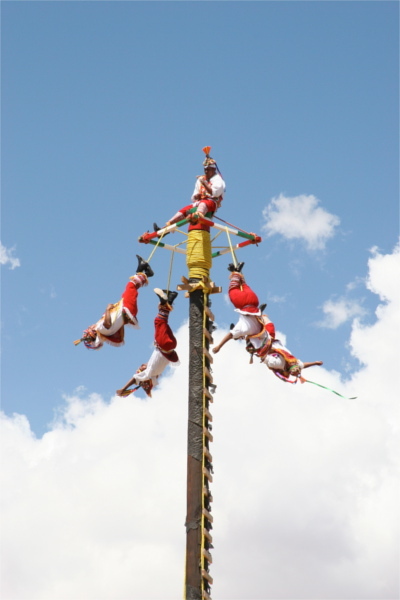 The Fiestas de Santa Fe’s proud religious and historical weekend of events have been an important part of Santa Fe’s Spanish culture since 1692. This initial rejection inspired Shus and friends to come up with a series of “counter Fiesta” events that took place the same weekend. They called it “El Pasatiempo”. The light-hearted shenanigans included the now much-loved Pet Parade, the Desfile de Los Niños, and the Hysterical Historical Parade, also known as the Desfile de los Gentes. The parades and burning ritual were so popular that the Fiesta Council acquiesced, and in 1927, Zozobra and Pasatiempo began the weekend’s celebrations. 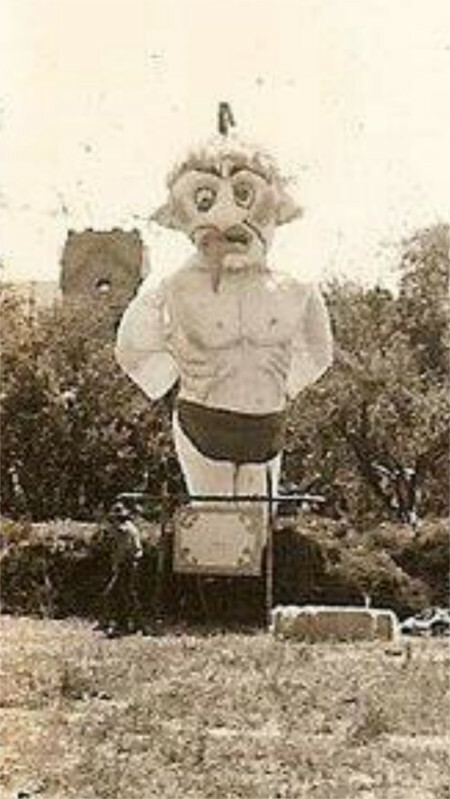 Zozobra in the year 1933. To this day, the Pasatiempo events remain part of Fiesta weekend, which is held the second weekend in September. Because of the extensive popularity of both celebrations, the Zozobra burning is now held the Friday of Labor Day Weekend, kicking off the week of events leading up to Fiestas. 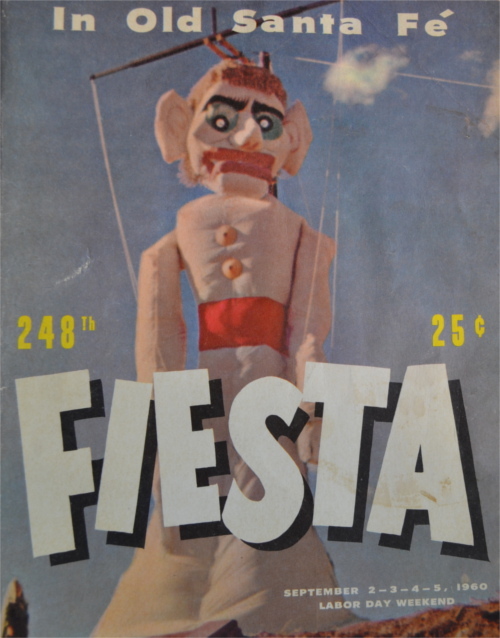 248th edition of the Fiesta Council’s publication “Fiesta” from 1960, features Zozobra on the cover. In 1964, after his first heart attack, Shuster entrusted the copyrights and all the secrets of Zozobra to the Kiwanis Club of Santa Fe, with the understanding that they would continue the tradition into perpetuity. He was sad to let go of his role with the puppet, but he continued to help with its creation until the year he died of his second heart attack in the spring of 1969. He was 75 years old. 1935 – Will Shuster with his creation. It is with great pride and diligence that the Kiwanis Club of Santa Fe works to continue the now time-honored tradition of Zozobra. 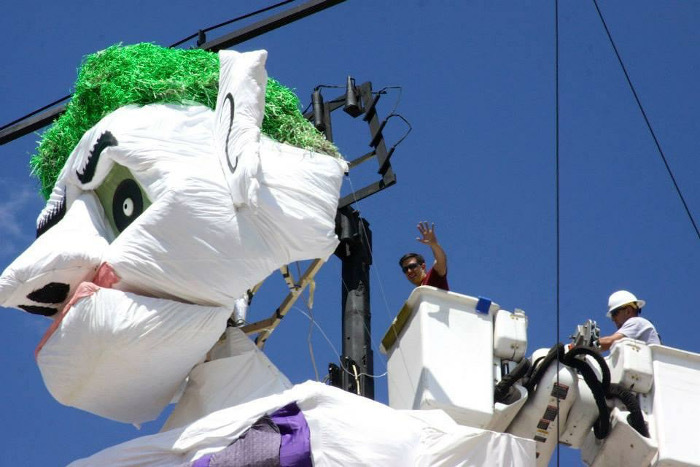 Kiwanis Club members and many volunteers work hard to bring Zozobra back to life each year. Santa Fean, Ray Sandoval has been a part of the production team for over 20 years. Ray’s enthusiasm and dedication to the event’s success seems to carry the spirit of Shus with him every year. Ray in his teens working with Harold Gans on the puppet head. 2014 – Ray taking a crane to work on the final touches and ensure the head is in place. From doom and gloom, goodness is born. The net proceeds from Zozobra’s ticket sales benefit numerous non-profit children’s health, education and recreation programs, both locally and internationally. By the year 2020, UNICEF projects that over 6,000 children’s lives will have been saved by the tetanus vaccines Zozobra has funded each year, since 2012. Zozobra is 93 in 2017, and the older he gets, the more he gains widespread fame and popularity. He’s the “nasty ol’ guy” you can’t help but love, and love to watch burn. He has gone from being a mostly local affair to being a spectacle that attracts tens of thousands of spectators from all over the U.S and from around the globe each year. The annual celebration is held the Friday of Labor Day weekend. The weather is often ideal at that time of year, but be prepared for the elements, because whatever the weather, Zozobra will burn! Click here for all ticket and event details and tips on “How to be an Expert Gloom Buster”. Come and join Santa Fe – cast off all your doom and gloom and celebrate the beginning of fall! 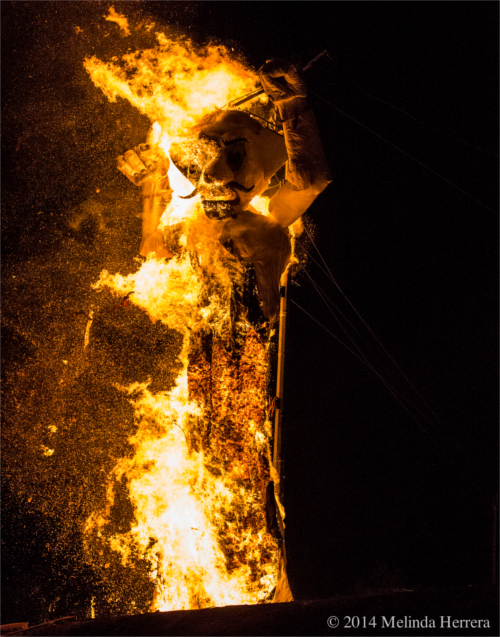 2014 Zozobra in full burn mode. Image by Melinda Herrera. Photo courtesy of Ray Sandoval. It’s recommended that you plan ahead to book lodging well in advance of the Labor Day Weekend. 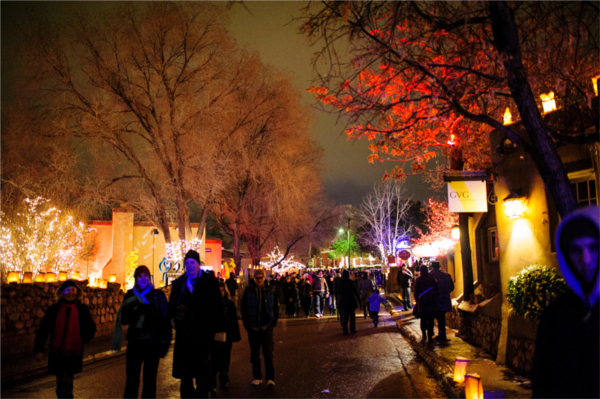 Here are some great discounts on lodging through SantaFeSelection.com Travel Guide & Concierge. And don’t just “burn and run,” you can spend at least three or four nights here and take in the sights. Enjoy the entire weekend – stay for the Fiestas Fine Arts & Crafts Market held the Saturday through Tuesday, on the Plaza, and many other fun events held during the following week of Viva La Fiesta! Explore more of the area’s historical and cultural attractions, culinary indulgences, world-class arts and leisure, and outdoor activities. 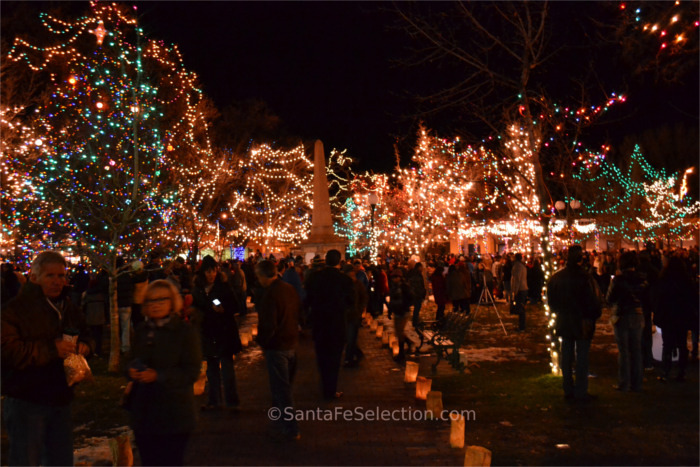 See this link for ideas on things to do in Santa Fe. 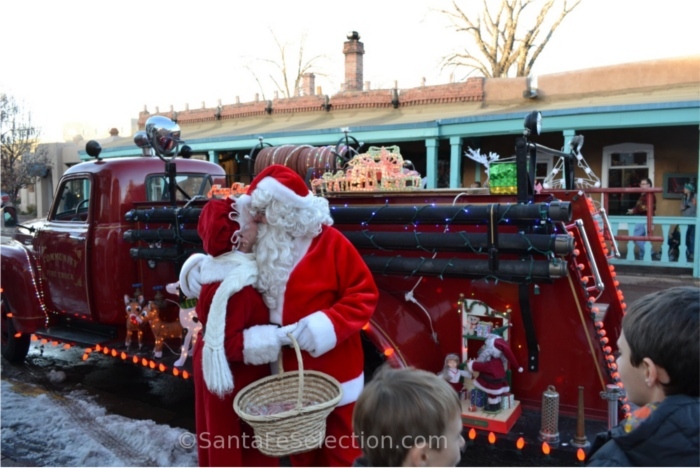 For lodging discounts and more information, call (505) 470-2991, or go to SantaFeSelection.com Travel Guide & Concierge. Thank you for reading my blog. 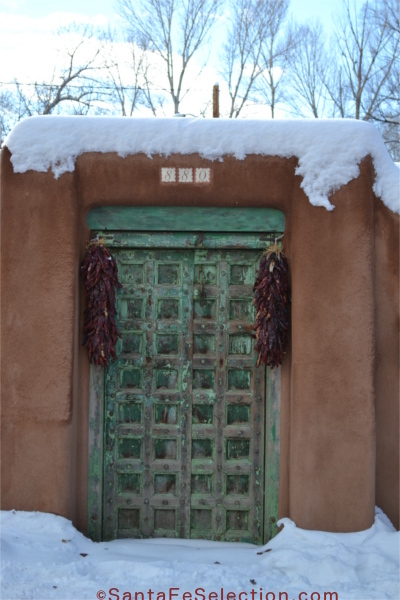 If you’d like to receive our monthly articles on the people, history, culture of Santa Fe and Northern New Mexico, Click Here to sign up. Thank you! Excerpts from Will Shuster’s Journals – Courtesy of Ray Sandoval. New Mexico Magazine, September 1989. 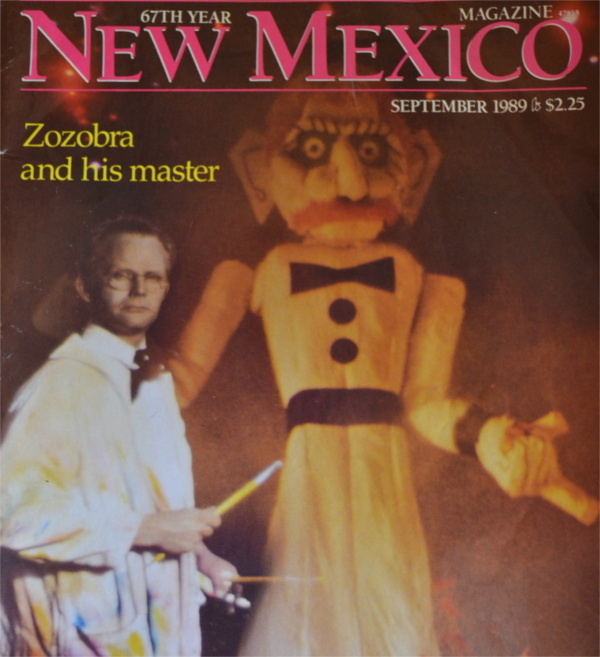 Article, “Zozobra and His Master.” – by Louise Turner and Joseph Dispenza. 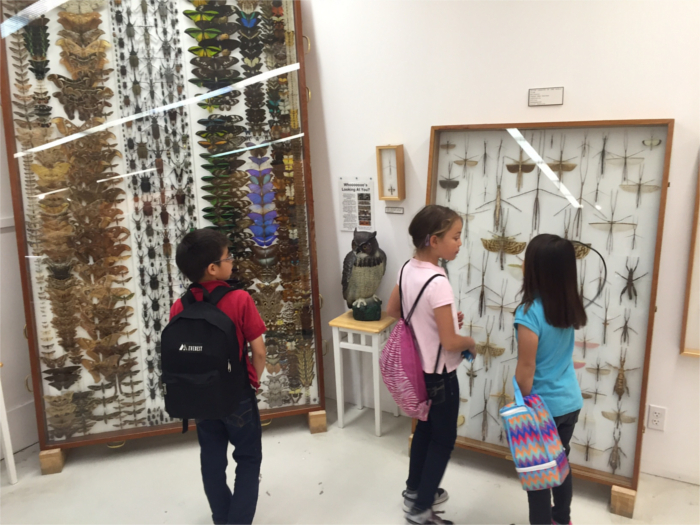 Kids will tell you that it’s tons of fun and worth a trip to the Harrell House Bug Museum & Science Shop in Santa Fe. Granted, bugs aren’t something many of us want to get cozy with, but owners Wade Harrell and Oliver Greer have created a unique opportunity for us to visit one of the largest and most diverse collections of insects in the United States. 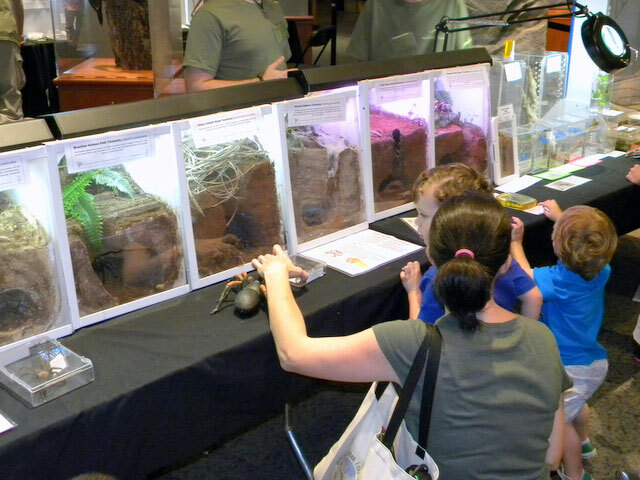 These experts have been “buggin’ out” since they were eight years old, and now they enjoy teaching us about a world of wonder and weirdness in the seemingly alien existence of bugs, amphibians, aquatics, reptiles, arachnids and more. Harrell House features Oliver Greer’s amazing Crawlywood Collection of over 2,400 mounted insects from around the world, including gigantic specimens, and those of an extremely rare variety that you will not see anywhere else. Don’t worry, they’re all under glass, but if you wish it is possible for you to touch some of the safer beings on view. They also have more than 100 live animals, including giant tarantulas as big as a dinner plate, scorpions that glow under ultraviolet light, invertebrates, reptiles, amphibians and fish, and lizards that remind us of dinosaurs. 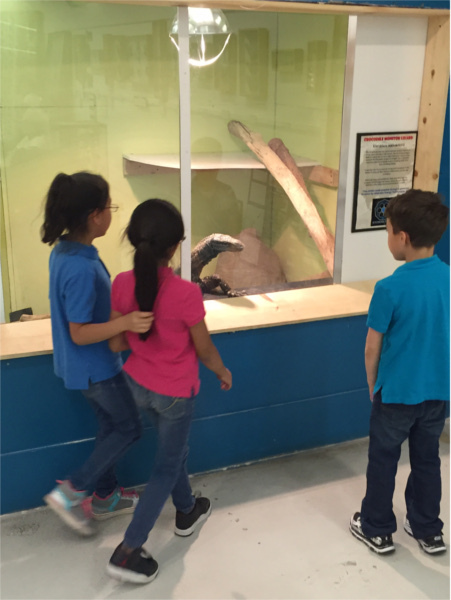 Live exhibit of arachnids (traveling exhibit). But similar nests are at the museum also. They have a giant monitor lizard too. Monitor Lizard poking his head up. – Harrell House. Every day at 4pm, there’s a feeding frenzy at Harrell House when visitors get to watch as the various meals are “dished out”. Mondays, Thursdays and Saturdays are reptile feeding days. The dish of the day is most likely of the cricket, worm, and rodent variety. Tuesdays, Fridays, and Sundays are the days for feeding the aquatics. Wednesdays are for the tarantulas, scorpions, and arachnid pals. They enjoy a menu of crickets, cockroaches and other such delights. There’s no doubt about it, there is a world of fascination behind the entry gates at Harrell House. 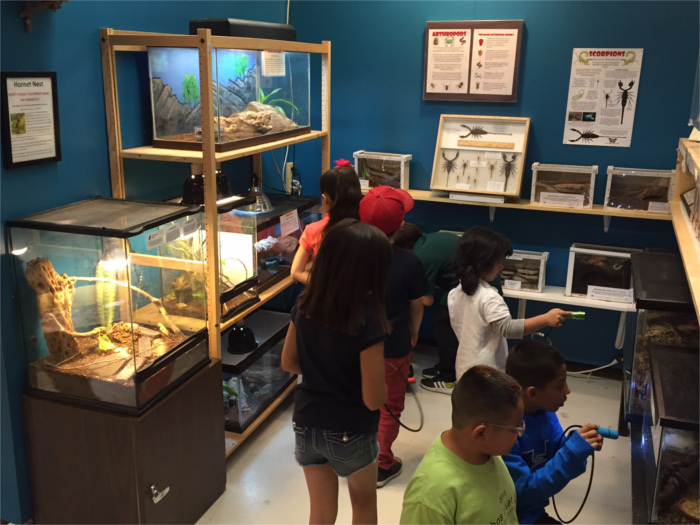 Entrance into their Science Shop is free, and it’s worth the small fee of only $4 (child) – $6(adult) to enter into the museum and exhibit area to meet these creatures – great and small. Kids with the museum’s flashlights to shine on the scorpions in their dark cages. I enjoyed asking Oliver and Wade many questions, some I’m sure you’ve probably had at some point or another about scary critters, such as Killer Bees, black widows, and brown recluse spiders (a variety I’m assured do not exist in Northern New Mexico to date.) I got the truth behind the legends and folk tales about some bugs, and how often they are greatly misunderstood – mostly because they’re not as pretty as we’d like. Oliver Greer speaking to an awe-struck audience. And to think that this is just a tiny fraction of the many thousands of varieties there are walking the earth with us. If you’re squeamish at the thought of bugs, this experience may change your thinking, or at least put some of your fears into a healthier perspective. But there are also some pretty amazing, scary critters in there too. If you’re planning a school outing, a party, or event and you want a little education to go with your “crawly” fun, Harrell House offers group rates for parties of 15 – 30 people, currently only $60 per group. Or if you prefer, they can bring a limited-sized bug party to your location for a reasonable fee. Don’t worry, they promise – no escapees. 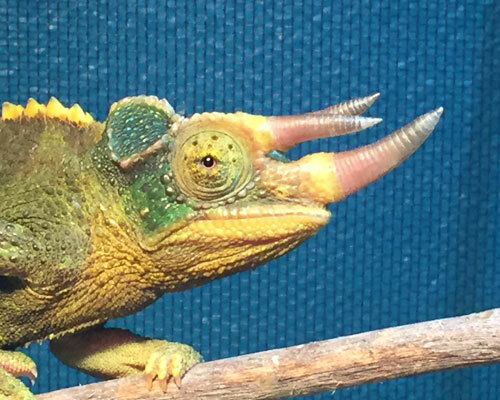 Chameleon – up close. Harrell House. 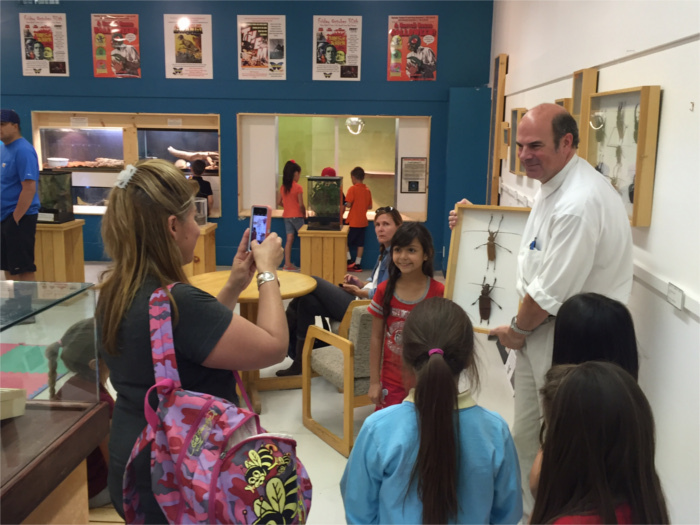 Whether you’re a kid or not, I highly recommend a stop at Harrell House Bug Museum…it’s a fascinating journey. They are conveniently located inside the De Vargas Mall at 552 North Guadalupe Street. Open daily: Mon-Fri: 10am – 7pm, Sat: 10am- 6pm. Sun: 12pm -5pm. Holidays, they’ll close at 5pm. Closed: Thanksgiving Day, Christmas Day, New Year’s Day and Easter Sunday. 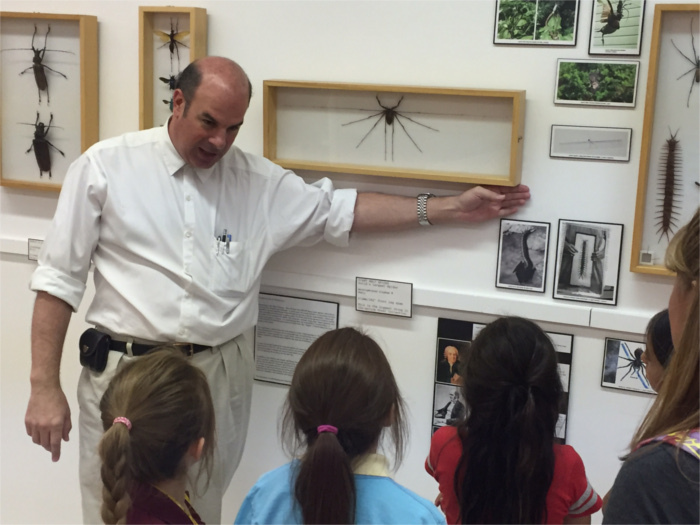 For more information or to book a group or party at Harrell House Bug Museum, please call Wade Harrell at (505)695-8569. Thank you for reading my blog. Please sign up here to receive my once monthly posts via email.